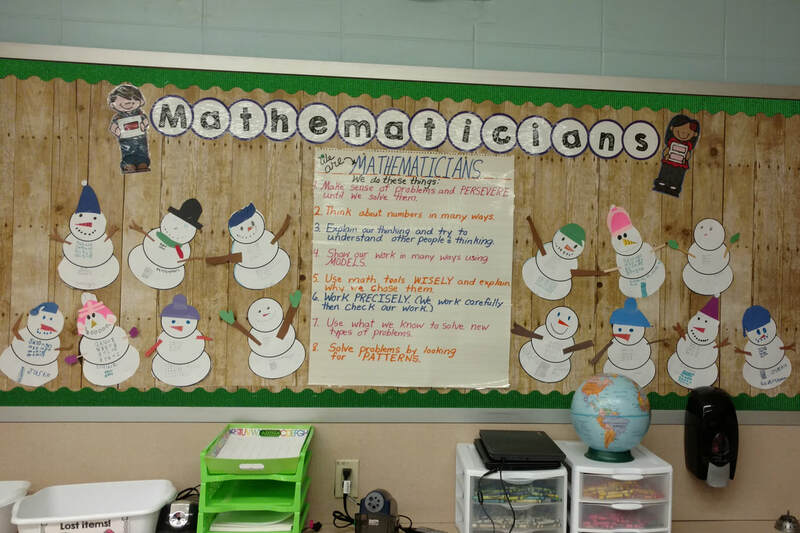 Since my last post, we have worked on several different topics in math! After completing our addition and subtraction unit, we started a unit of fractions. Students worked hard to show fractions, name fractions, compare fractions, and find equivalent fractions. The children created drawings and number lines and used fraction bars throughout our fraction unit. 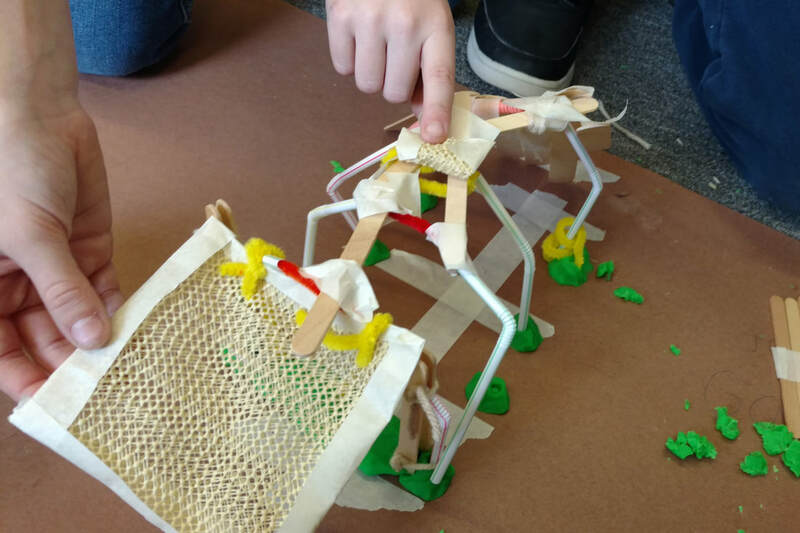 ​Right before vacation, the children did some EGGS-cellent review! Around the classroom were plastic eggs. 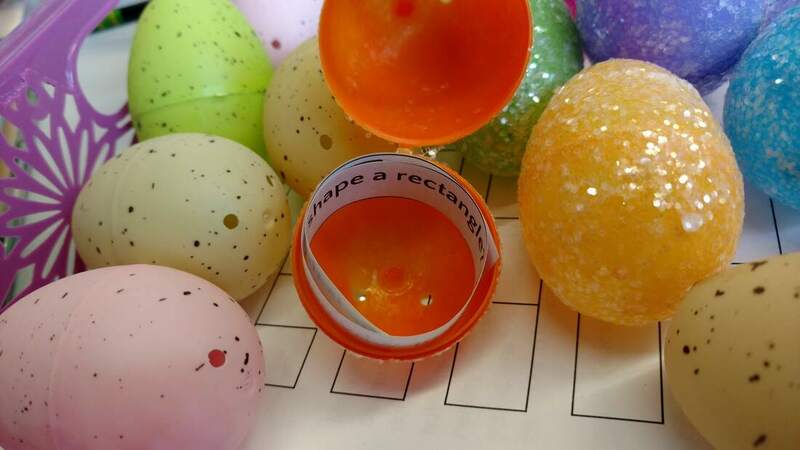 Within each egg was a math review question related to topics we've covered. Everyone worked hard to solve the problems. If you would like a fun review option, I HIGHLY recommend checking out abcya.com. Online play is free. The Fraction Fling game is fun. 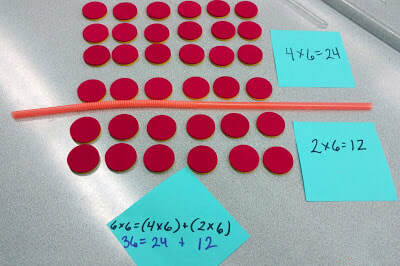 There are also fraction tiles that your child can use to explore. 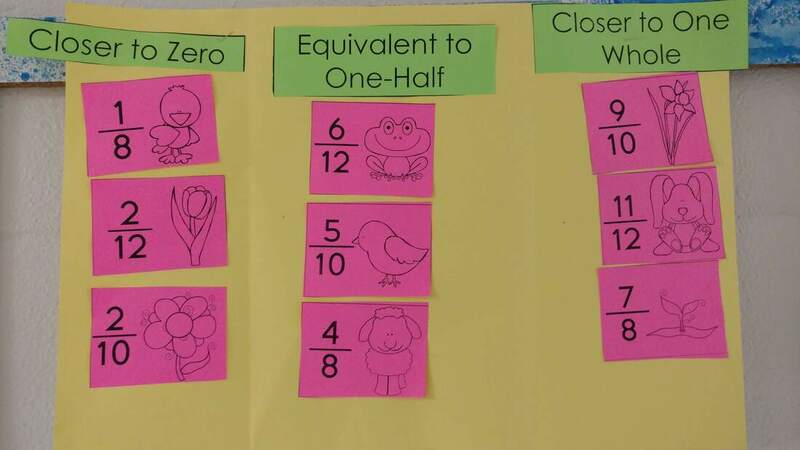 Your child can drag fraction tiles to the work space to find equivalent fractions or to compare the sizes of fractions. 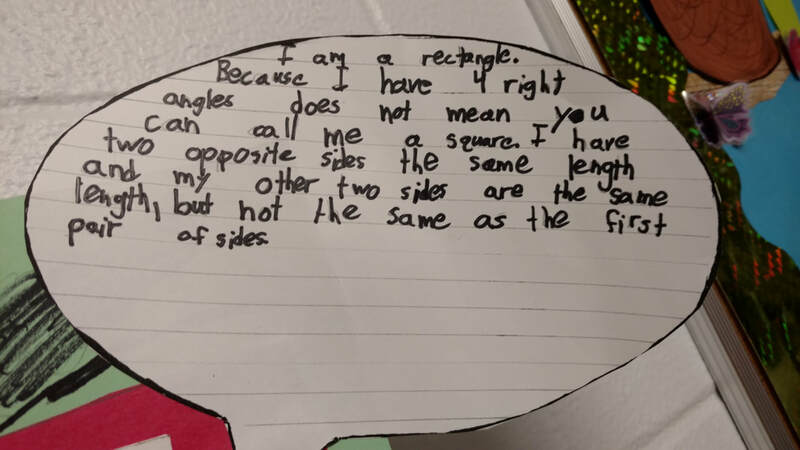 Students practiced describing and classifying quadrilaterals based on their attributes. 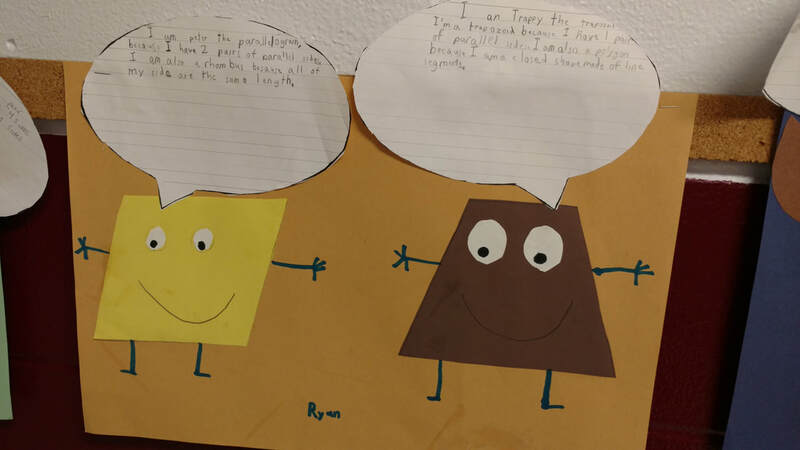 They created fun Quadrilateral Quotes posters to show off their knowledge. In other math news, the children have continued to work on committing multiplication facts to memory. One of their favorite ways to practice is to set a fidget spinner in motion and do as many facts as they can before it stops. During our writers workshop, students have finished and presented their Question and Answer books, which they created in Google Slides. Students also completed an opinion essay with multiple paragraphs! 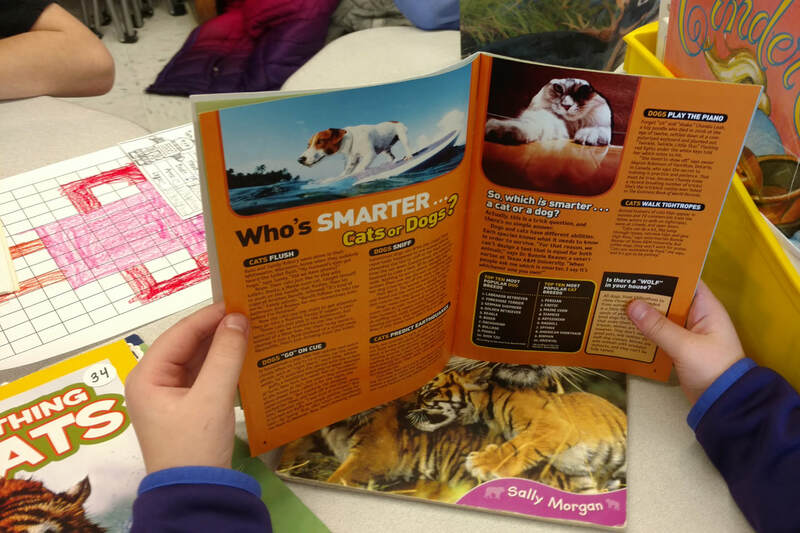 They chose to read articles about either school lunches, recess, or working dogs. After reading, they formed opinions and planned how they would support those opinions with reasons, details, and examples. They needed to incorporate facts from their research to write convincing pieces. All students worked hard on their pieces and had the opportunity to share them with their classmates. In reading, we've worked on several concepts. 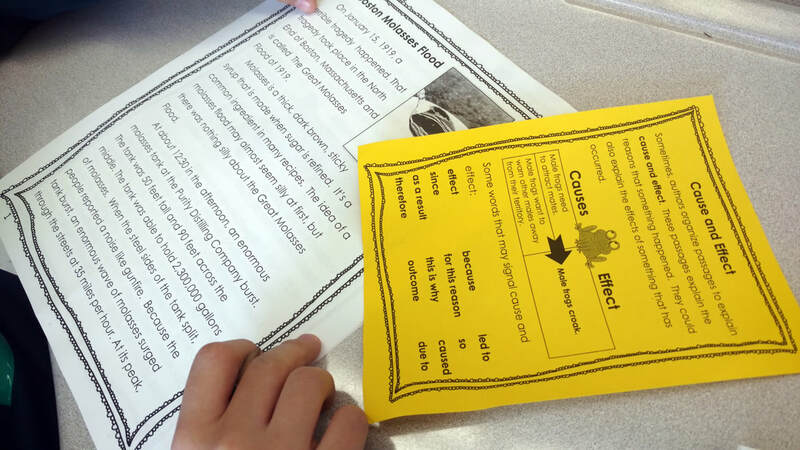 Students examined nonfiction text features and illustrations in stories. 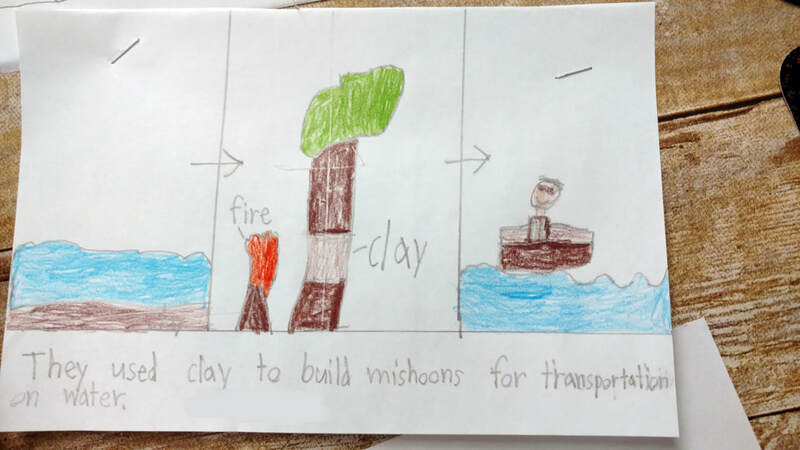 We've learned about how images and text features work with the text to help readers learn. We've also worked on central message. We've discussed that the central message is the author's message to us about life. It's the big idea in a story. We've read several stories and fables. 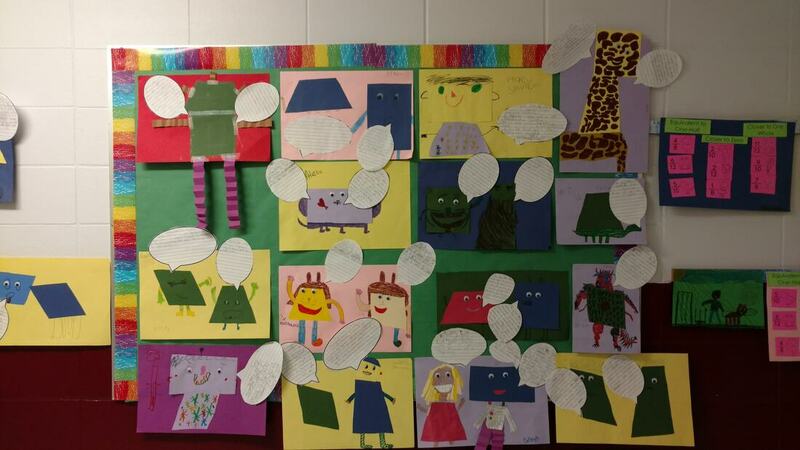 We worked on summarizing and compared the plot, the characters, and the messages of each story. 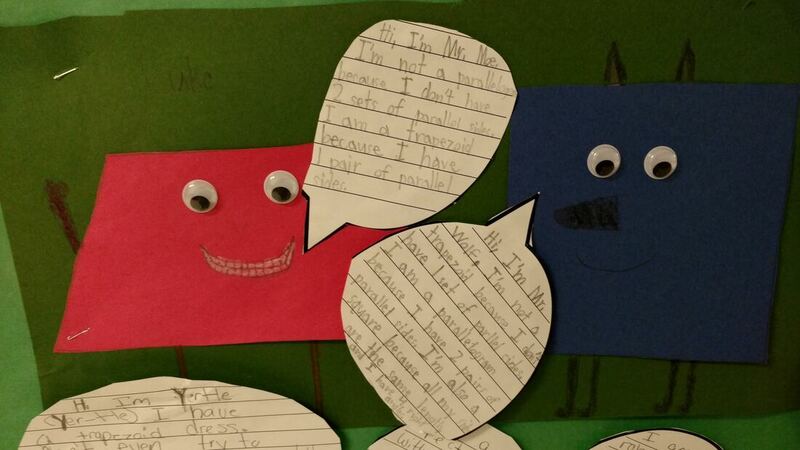 We've learned that very different stories can actually have similar themes. 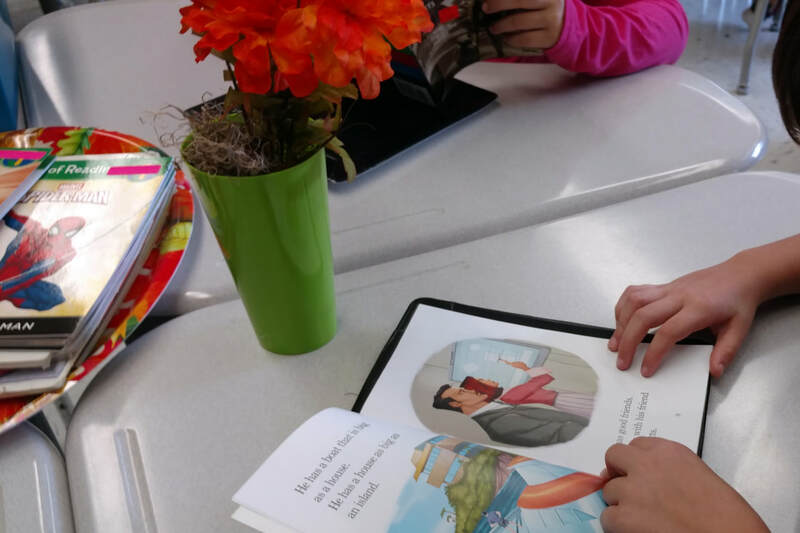 Students also spend quite a bit of their time reading from books they've chosen themselves. 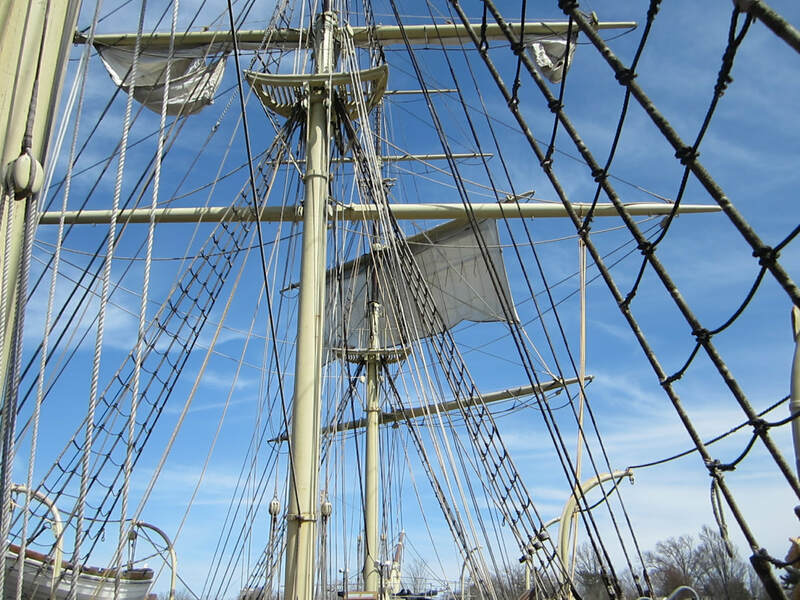 We were so fortunate to have an in-school visit from Natasha from Mystic Seaport! The PTA generously supplied grade 3 with the funds necessary to make the visit possible. Thank you SO MUCH to every member of the PTA. Your hard work and generosity make our school a special place. Natasha came in to do a lesson about the history of whaling in Connecticut. 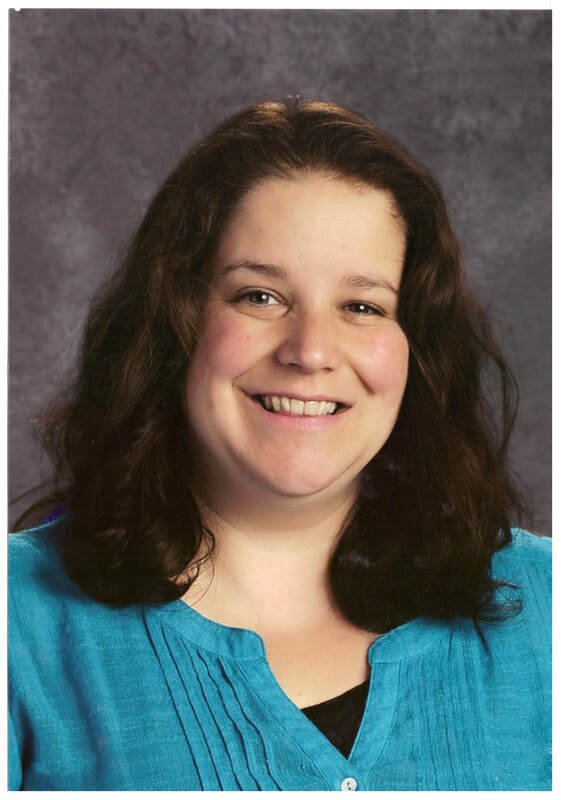 She taught students about the types of whales that were most commonly hunted. She explained why those types of whales were hunted and brought artifacts to show the students. Above, you'll see a tiny bottle of perfume with ambergris in it. What is ambergris, you ask? Prepare yourself for interesting and gross information! Ambergris is found in the intestines of sperm whales. It forms when the whale's body coats hard indigestible bits of the whale's meal. (For example...the hard beaks of giant squid.) Apparently, ambergris is very expensive and is used in perfumes. The sperm whale is our state animal. PTA Family Movie Night - April 26, 2019 at 6:30 p.m.
We've had a busy month! Thanks for stopping by to see what we've been up to. During math, we've finished up our unit on area. We'll be continuing to do a quick daily review, since some of the concepts are a bit challenging! 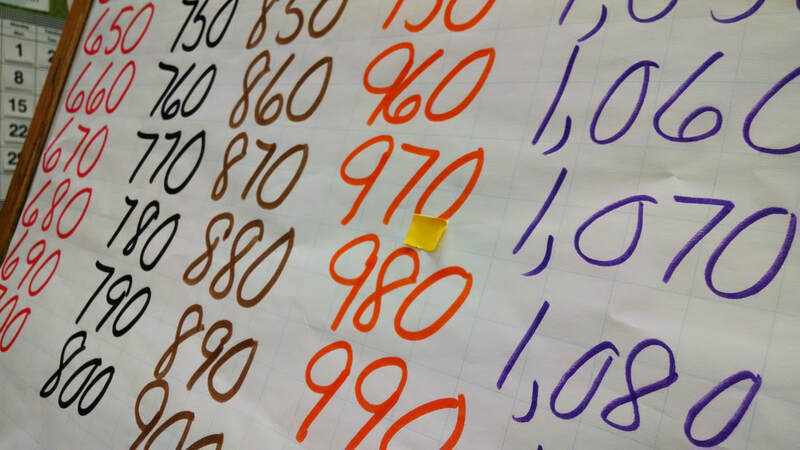 Students also practiced strategies for multiplying one-digit numbers by multiples of ten. For example: 5 x 70, 60 x 4, etc. 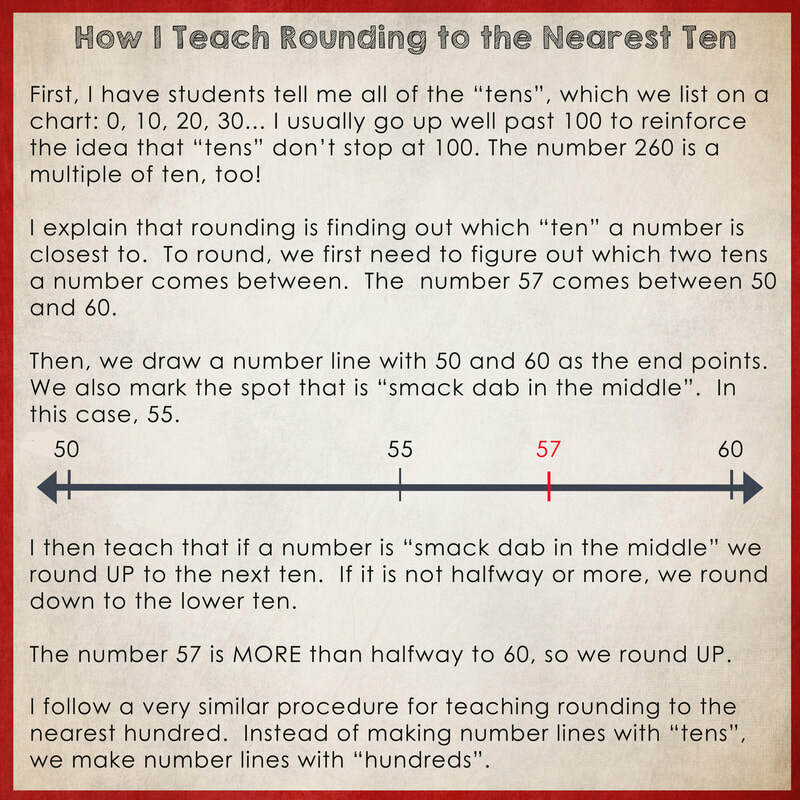 Currently, we're working on a unit that includes rounding, estimating, and addition and subtraction with regrouping. We've been focusing heavily on main idea and supporting details during reading. 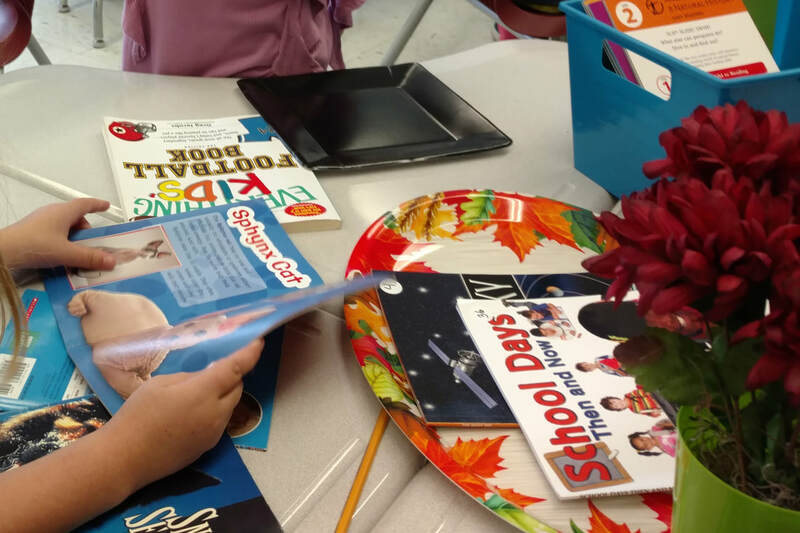 We've been reading widely in a variety of nonfiction books and articles. Next up: Finding the author's message in nonfiction and fiction texts. Please continue to have your child read for pleasure and practice for 20 minutes per night whenever possible. Reading a lot is the best way to improve as a reader. The children have finished taking notes and sorting them into categories. Currently, the children are writing the rough drafts of their question & answer books in Google Slides. Above you can see some copies of drafted pages. We'll edit and revise as part of the process. 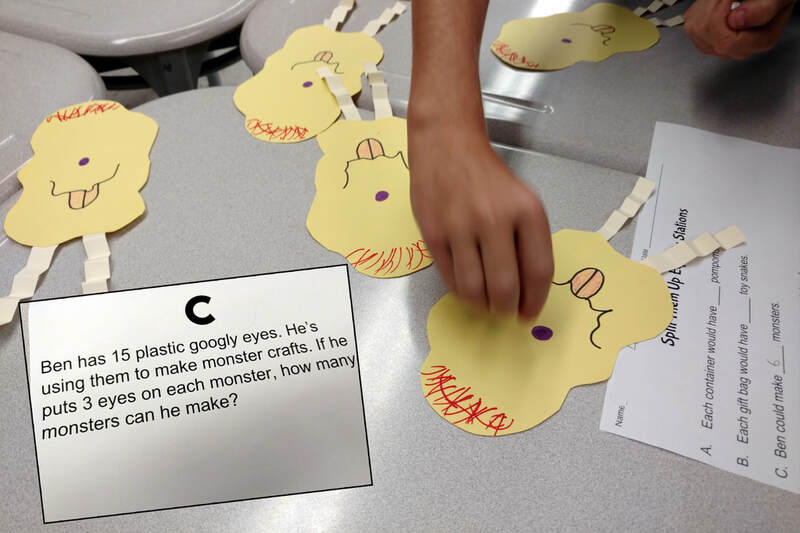 Students will also add images and text features such as glossaries. We've been doing a unit on Animals Through Time during our science block. 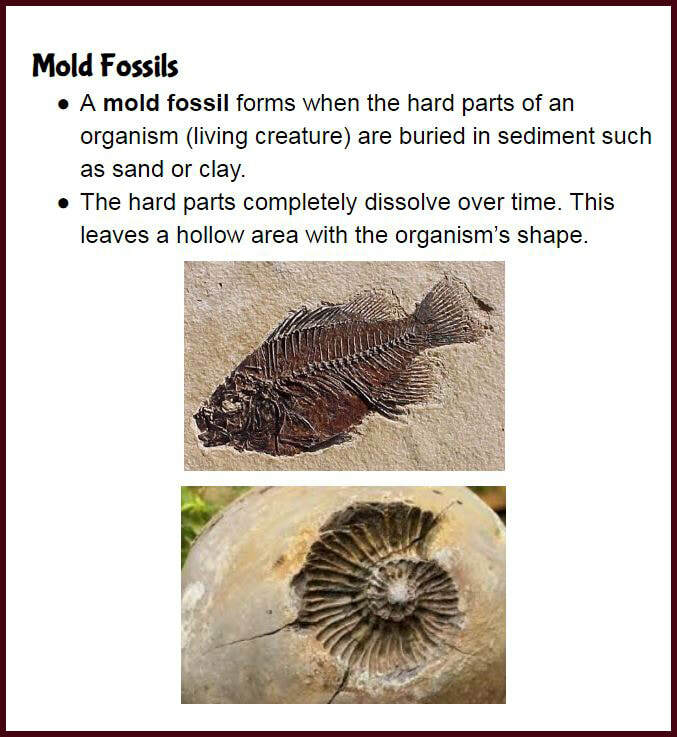 We learned about types of fossils, how fossils are formed, and how fossils teach us about life long ago. 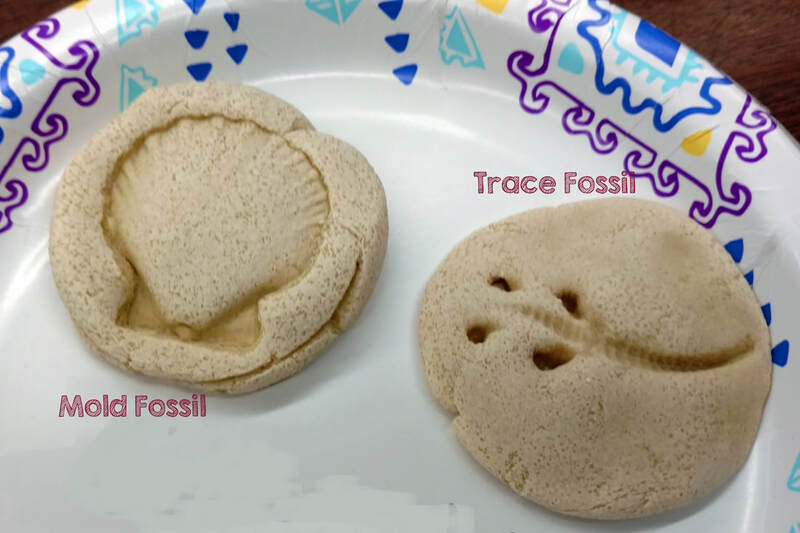 We made our own mold and trace fossils using salt dough. We've also been learning about inherited and learned traits and how working in groups can help animals survive. PTA Family Movie Night - Feb. 8, 2019 at 6:30 p.m.
Class Valentine's Day Party - Feb. 13, 2019 at 2:15 p.m. Happy New Year families! It was so wonderful to see the children last week and to get back into our school routine. During December, the children continued to work on multiplication. They used multiplication to solve multistep word problems. 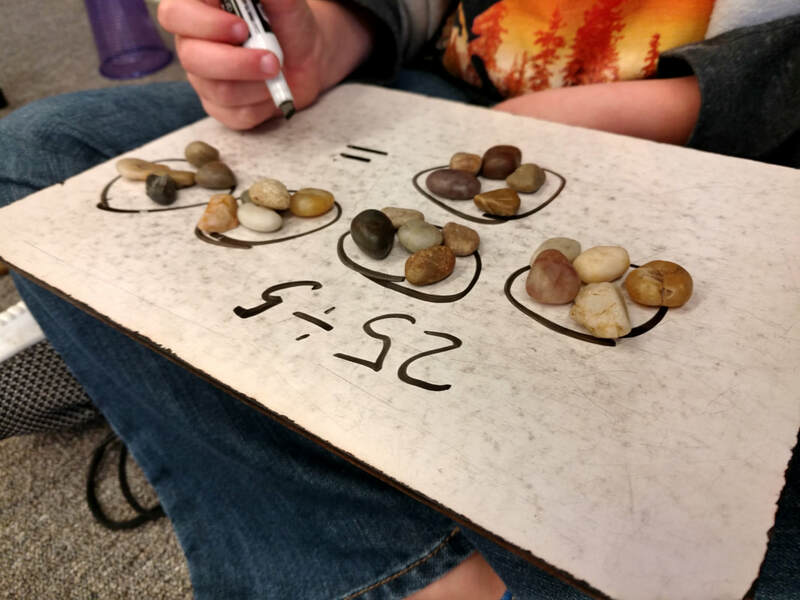 In addition, they did many activities that would help them understand the relationship between multiplication and division. 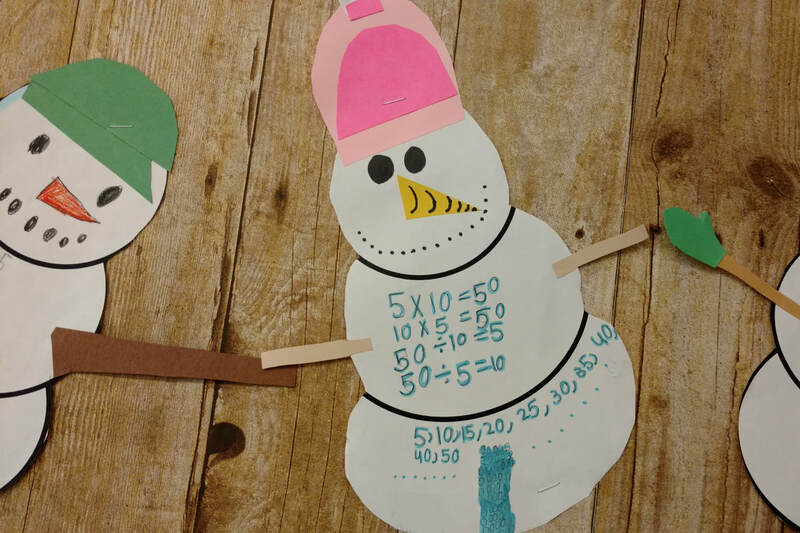 We created these fact family snowpeople for practice and also to add a bit of wintery fun to our classroom. 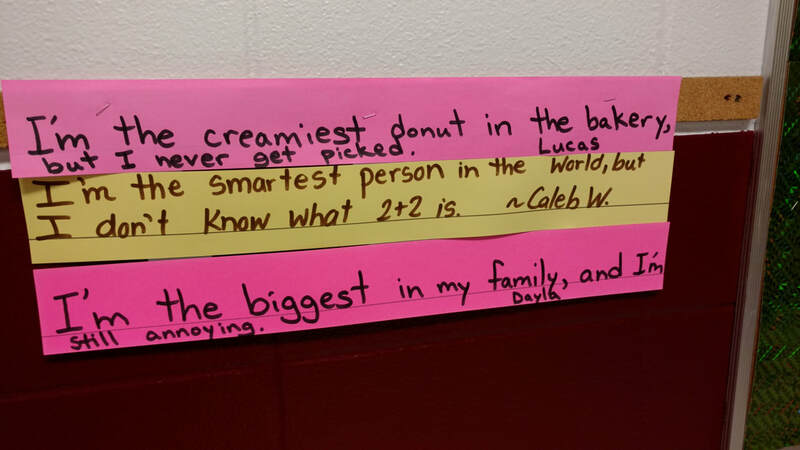 We'll continue to practice facts at school. 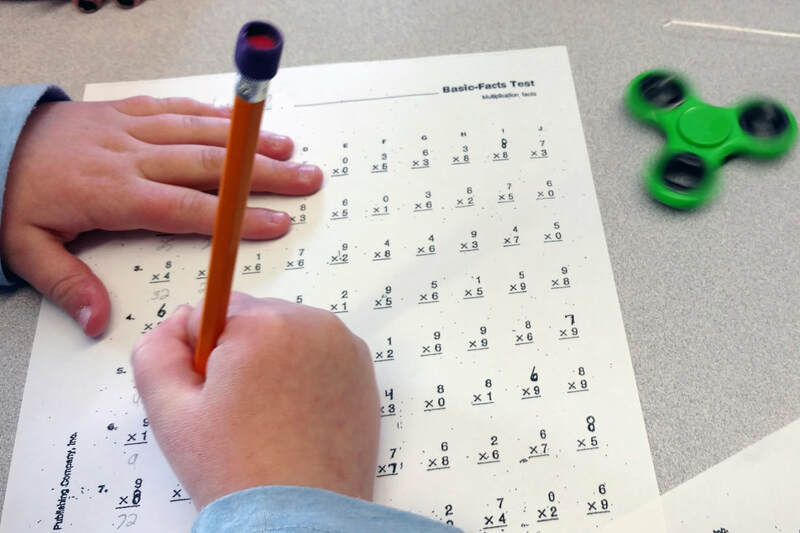 Please continue to have your child practice multiplication facts at home as well. We've started working on area in math. 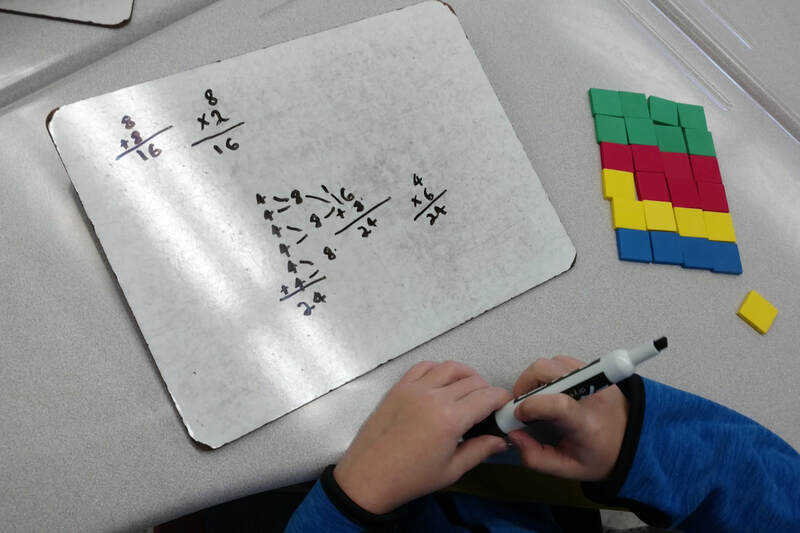 The students have learned what area is and have been exploring strategies to find the area of a given figure, including counting and multiplication. 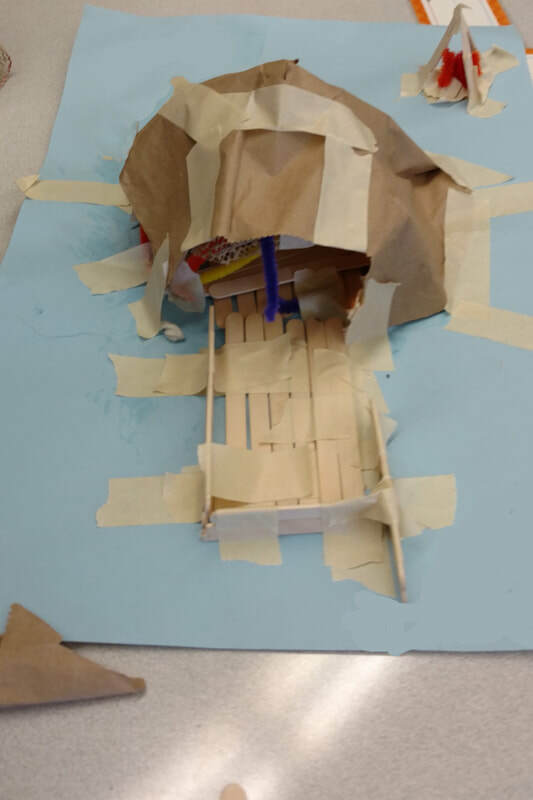 Just before vacation, we finished up our point of view unit in reading. Currently, we are working on finding main ideas and details in nonfiction text. 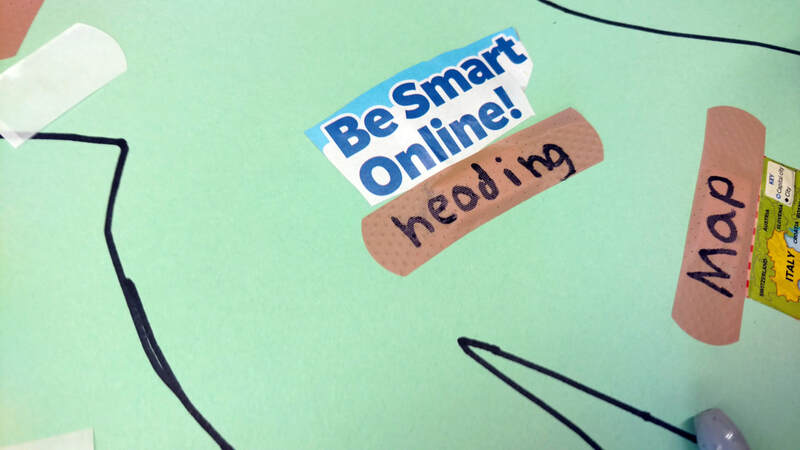 In writing, we've ended our unit on realistic fiction. 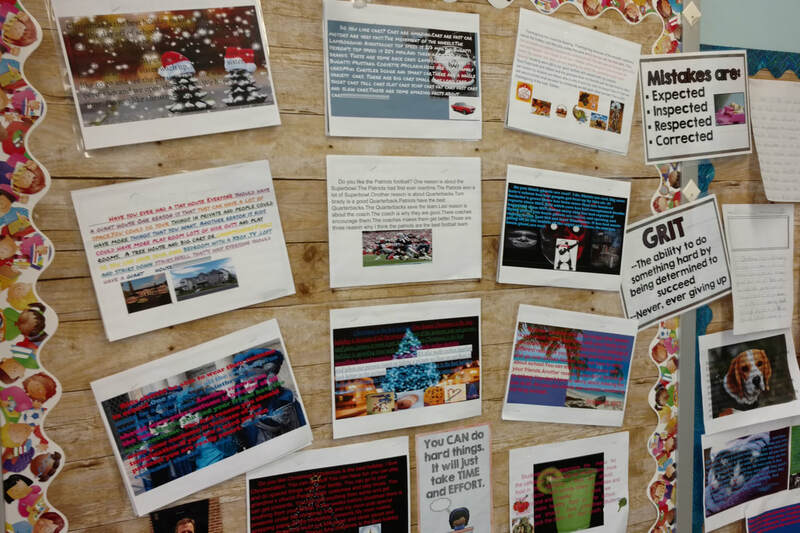 Over the course of the unit each student planned, wrote, edited, and revised more than one story. Our new focus in writing is nonfiction! 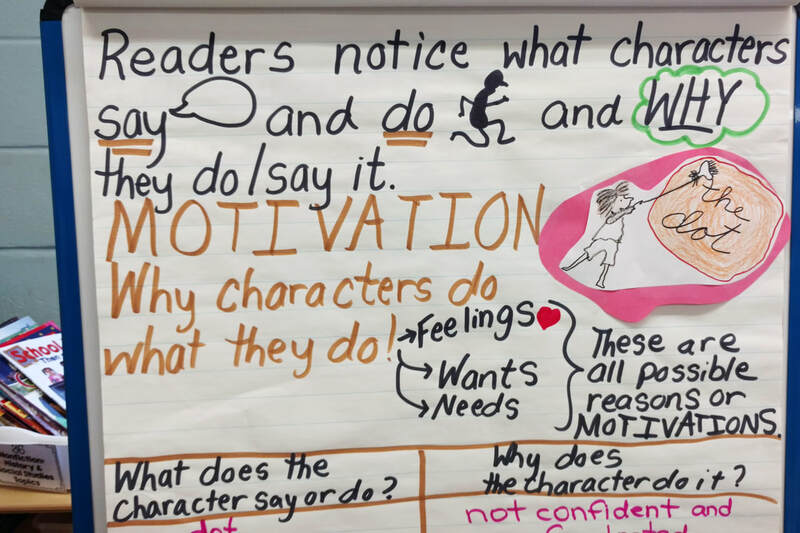 Our study of main idea in reading will carry over into our writing unit. 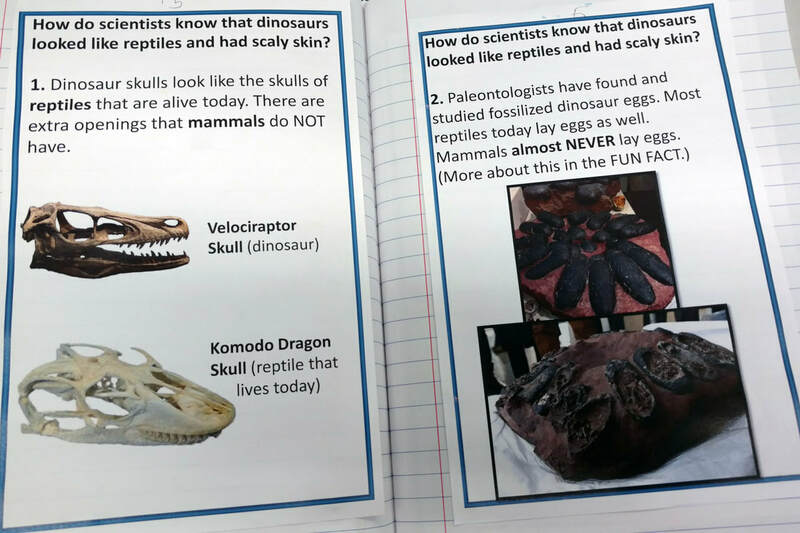 The children have all chosen nonfiction topics and have started to research and take notes. Later, they'll sort their notecards into categories based on main idea. The end product will be a Question and Answer book! 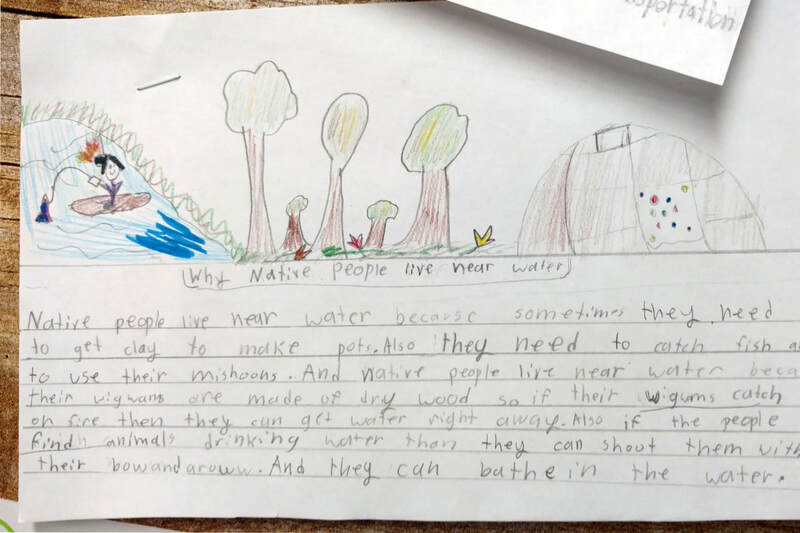 Our unit on Native Americans has also finished. 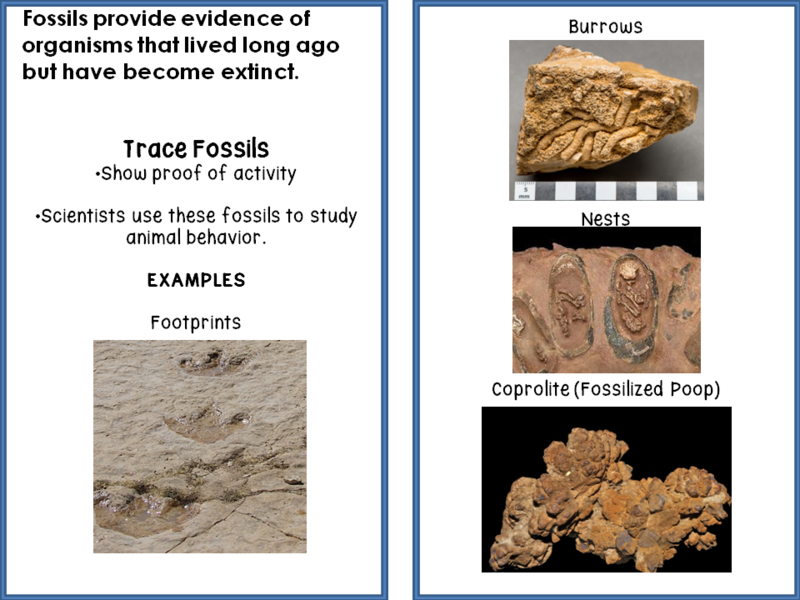 We've started a unit on fossils and what examining them can teach us. Happy November families! I'm glad you visited to get a glimpse of what we've been doing. During math, we've continued to work on multiplication. 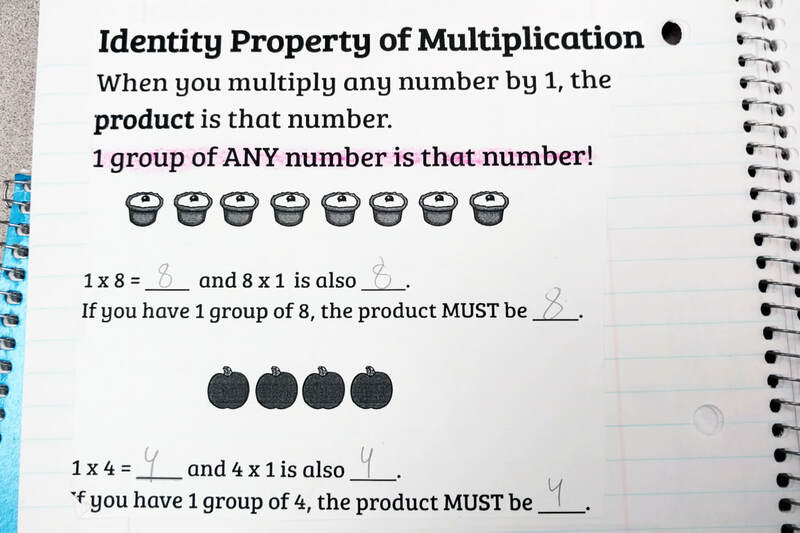 The students have learned about and applied The Distributive Property of Multiplication. ​I explain it to the kids simply: You an split apart a tricky fact into smaller facts. 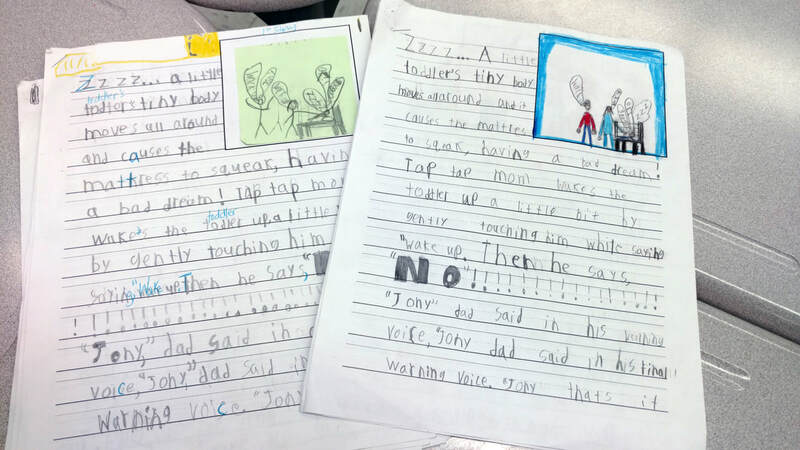 In writing, students have started planning and drafting realistic fiction stories. 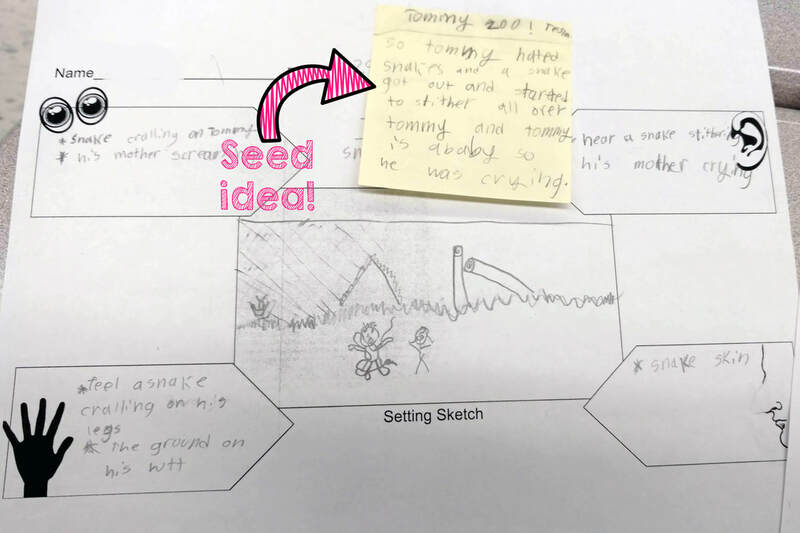 We discussed the difference between PUMPKIN ideas (which are too big and broad) and seed ideas, which are specific and focused. 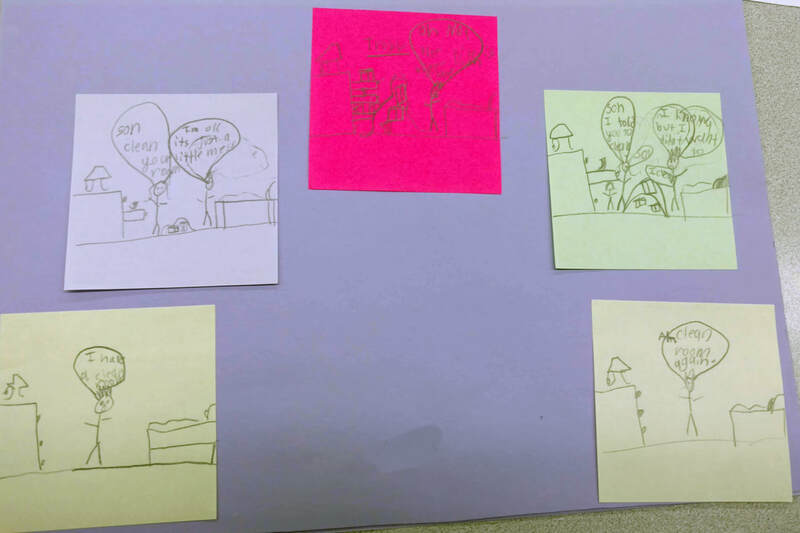 The children have practiced developing characters and settings, planning their stories across post it notes, and drafting stories. Some of the techniques we've worked on are writing entertaining beginnings, s-t-r-e-t-c-h-i-n-g out the action, adding interesting dialogue that moves the story along, including characters' thoughts and feelings, and adding descriptive detail. 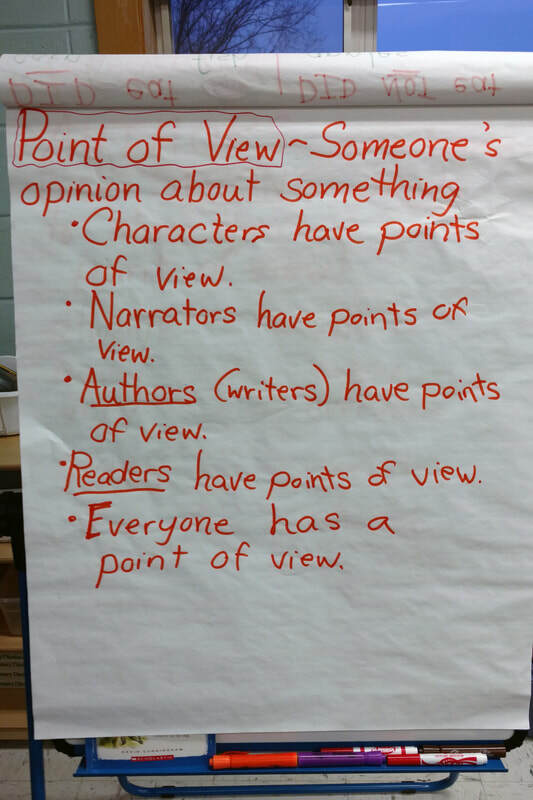 Students have been learning all about point of view in reading. 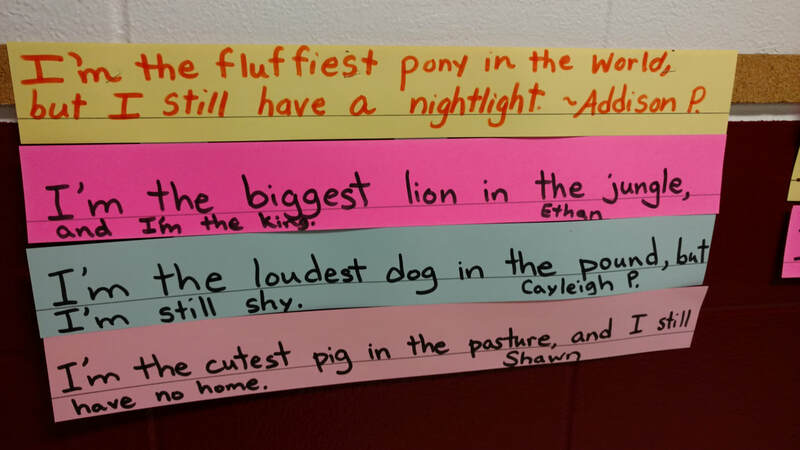 We've learned that characters in stories have points of view and that authors of nonfiction pieces also have a point of view. Finally, readers have a point of view that helps them understand what they read. Sometimes readers agree with a character or author, and sometimes they don't. 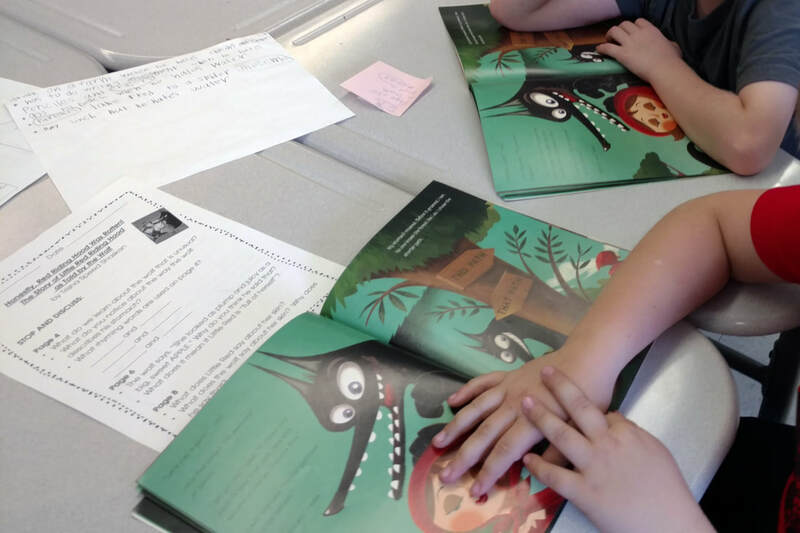 We've been reading widely in both fiction and nonfiction texts as we practice this skill. 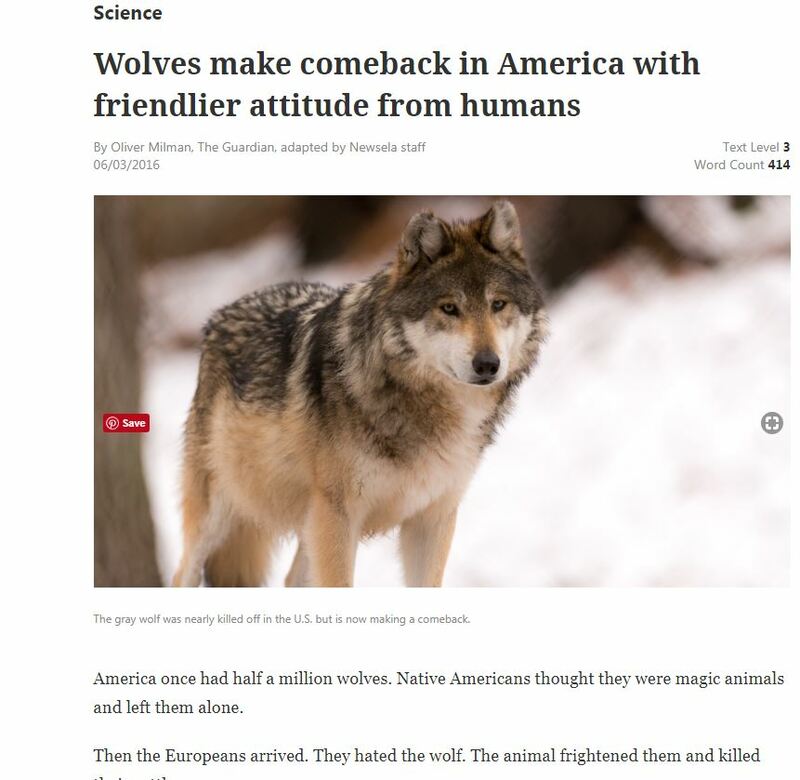 Students read nonfiction news articles about wolves from a site called newsela.com. 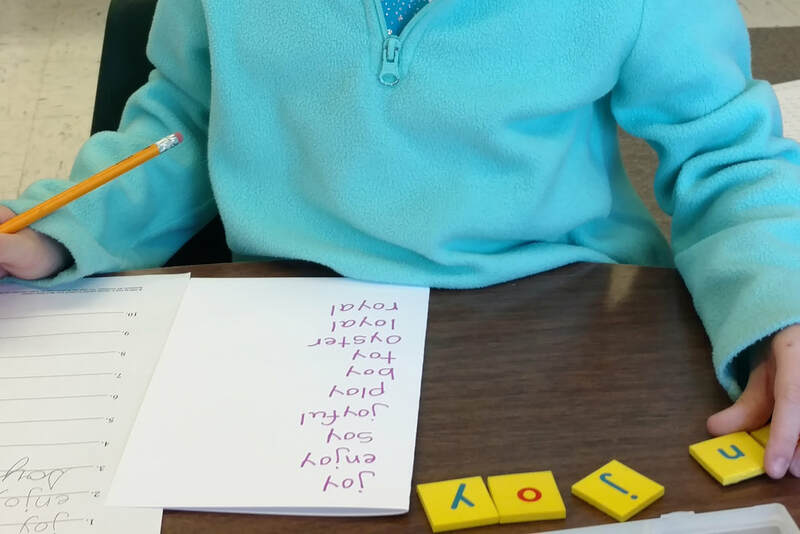 During our word study block, we've been reading and spelling words with different vowel combinations. 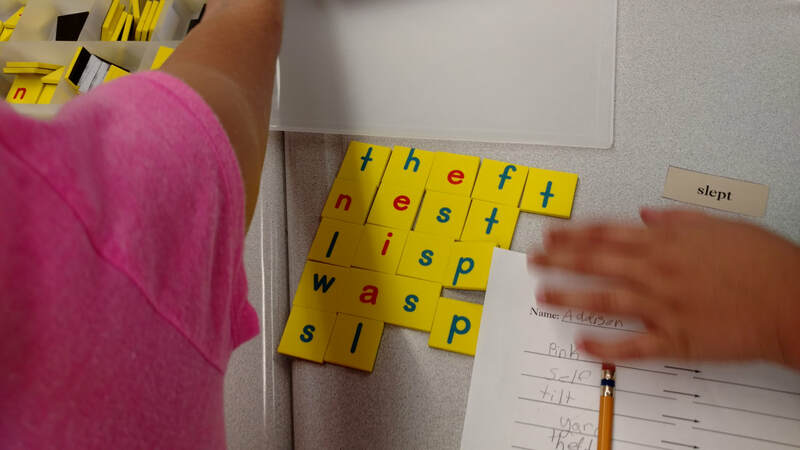 Students have also had the opportunity to use a reading/phonics program called Lexia Core 5 to practice more individualized skills and concepts. 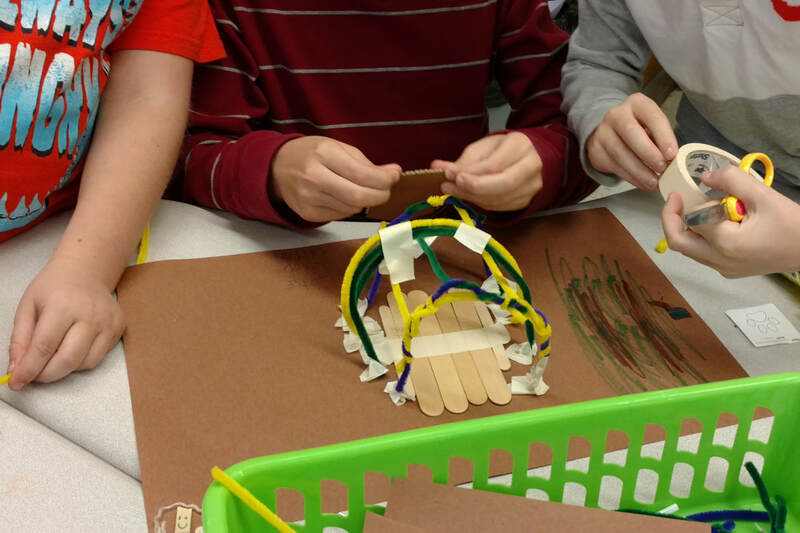 .We've finished up our weather unit and are currently learning about Native Americans of the Northeast Woodlands. 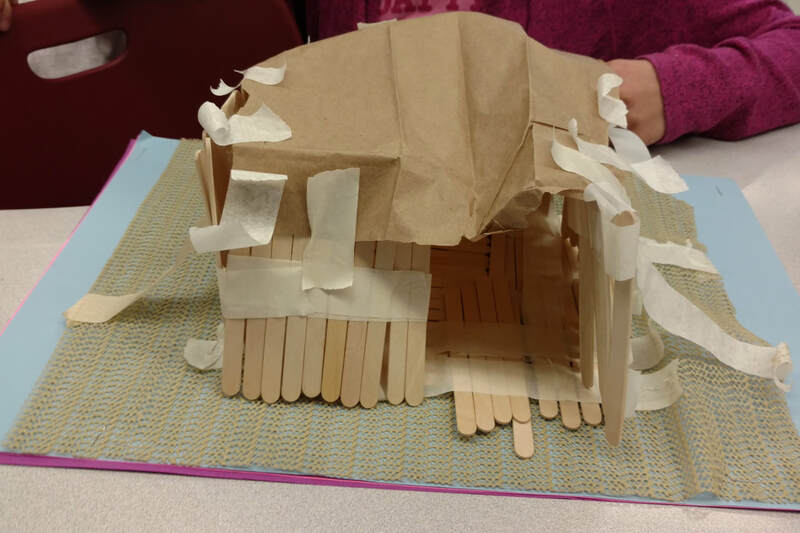 The students have learned about wigwams, which were typical Algonquin homes. 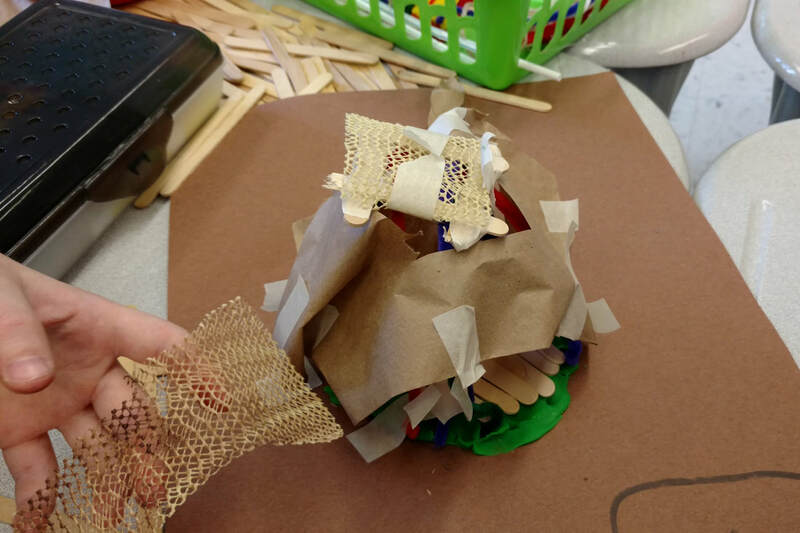 They've also been issued a challenge to create a model of a wigwam using a variety of materials. Students needed to plan individually and then share their plans with their small group members. The members of the group then needed to decide how to compromise and combine their plans in order to meet the challenge successfully. 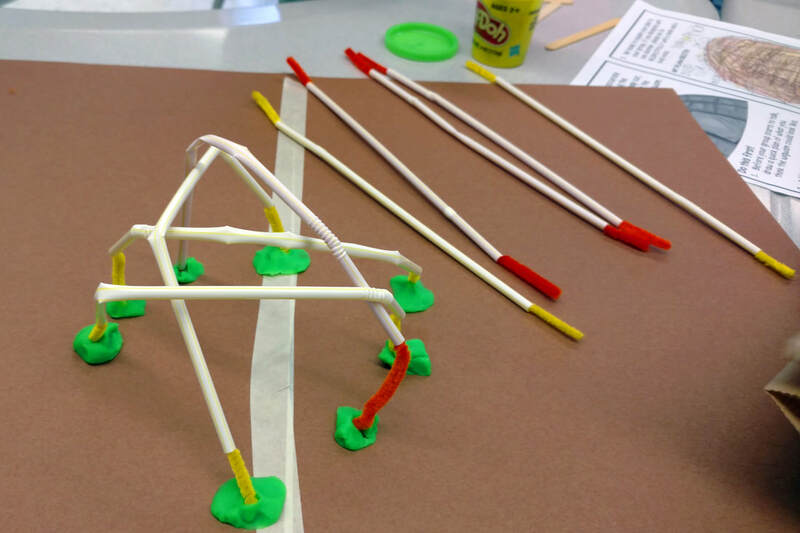 Construction of wigwams has now begun! BINGO for BOOKS -- November 29, 2018, 6-7 p.m. 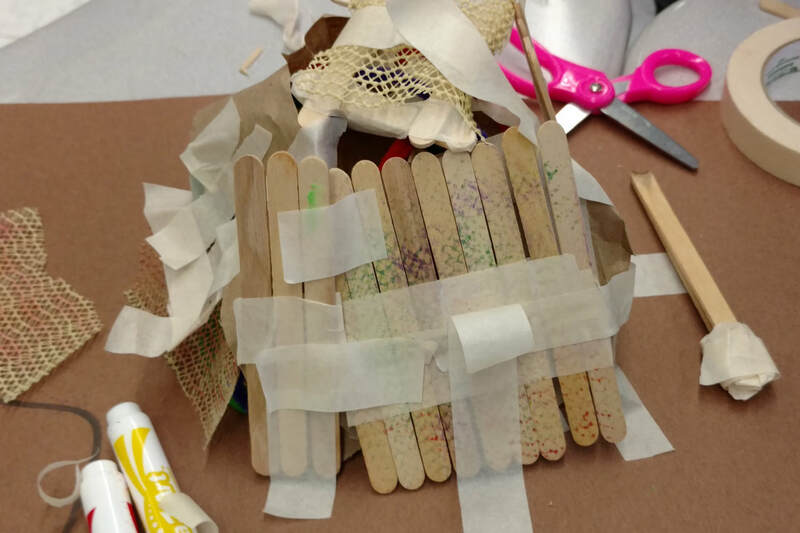 Welcome to the very first blog post of the new school year! I wanted to take a moment to say how nice it was to meet all of you at Open House. In addition, I'd like to thank you for sending in headphones or earbuds for your child and for all of the generous donations. 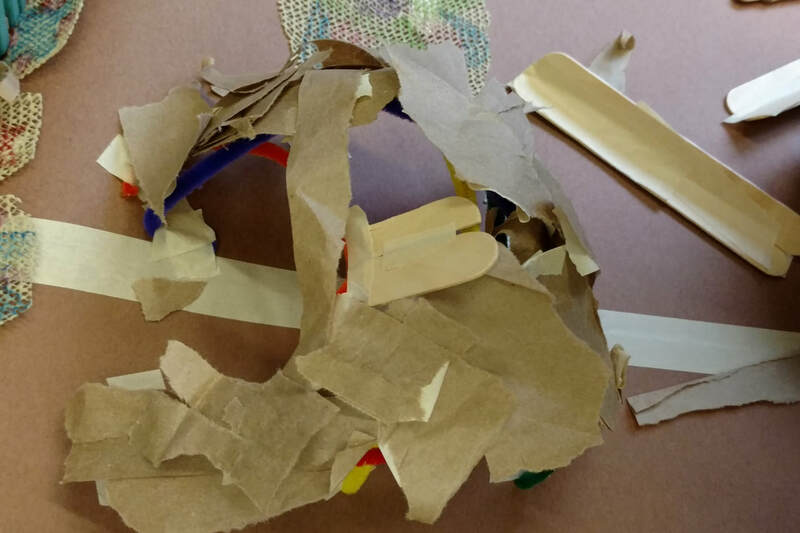 The children have been extremely busy, and we've really been growing together as a class. 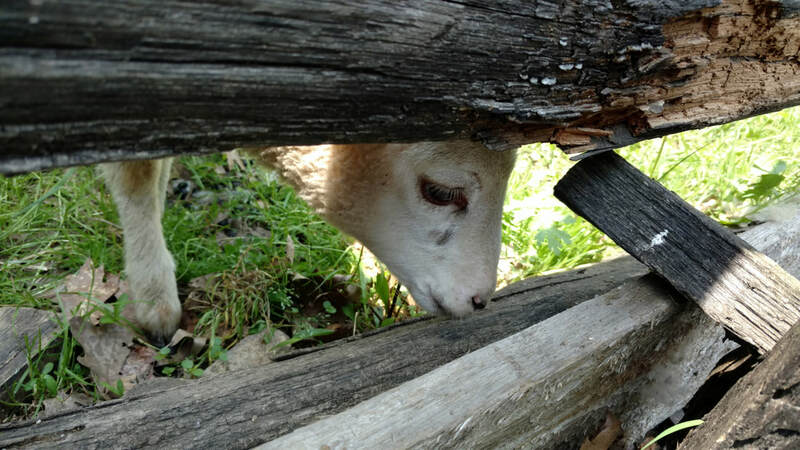 Thanks for stopping by to read about what we've been doing. 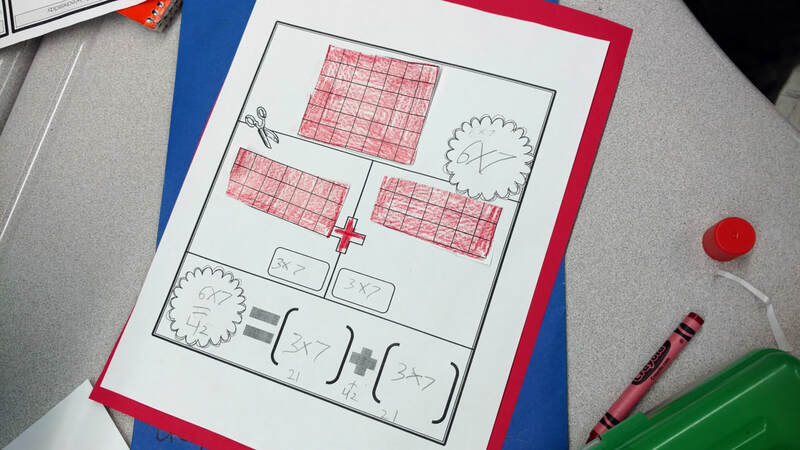 During our math block, we've been working on multiplication and division concepts and have been practicing 0x, 1x, 2x, 5x, 9x, and 10x facts. 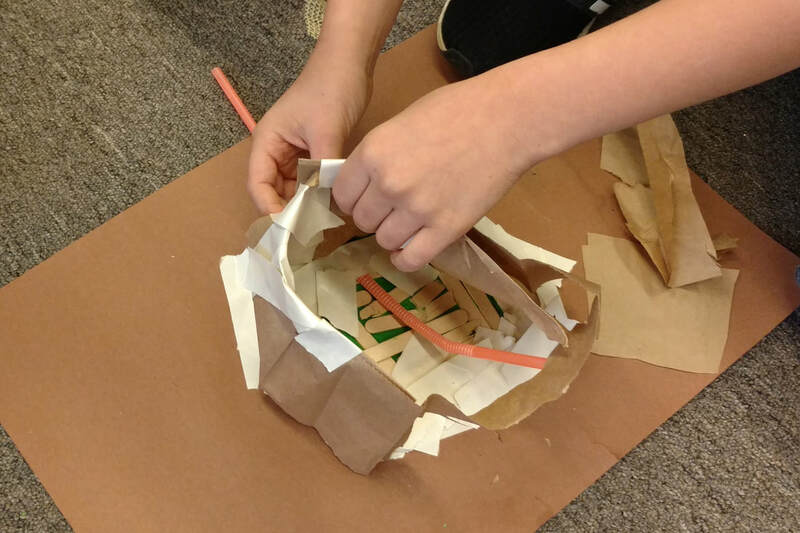 We practice with hands-on tasks as well as paper and pencil tasks. 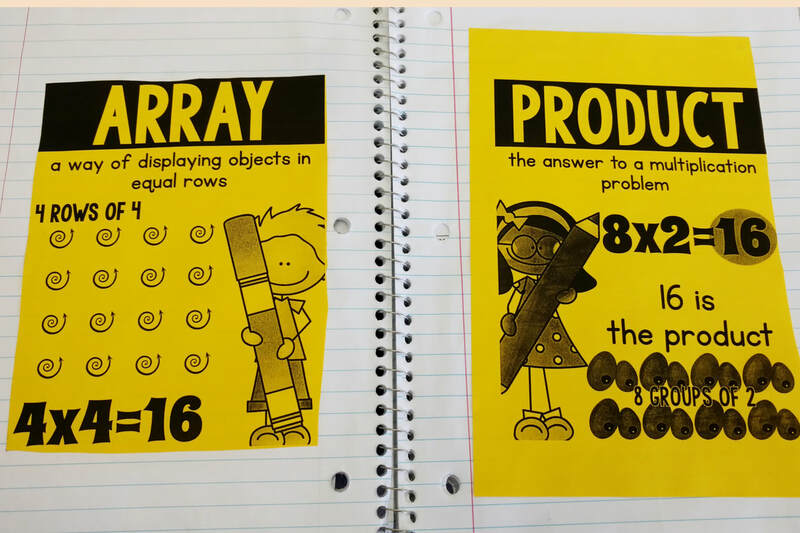 In addition, students have a math notebook that will be filled with reference materials by the end of the school year. 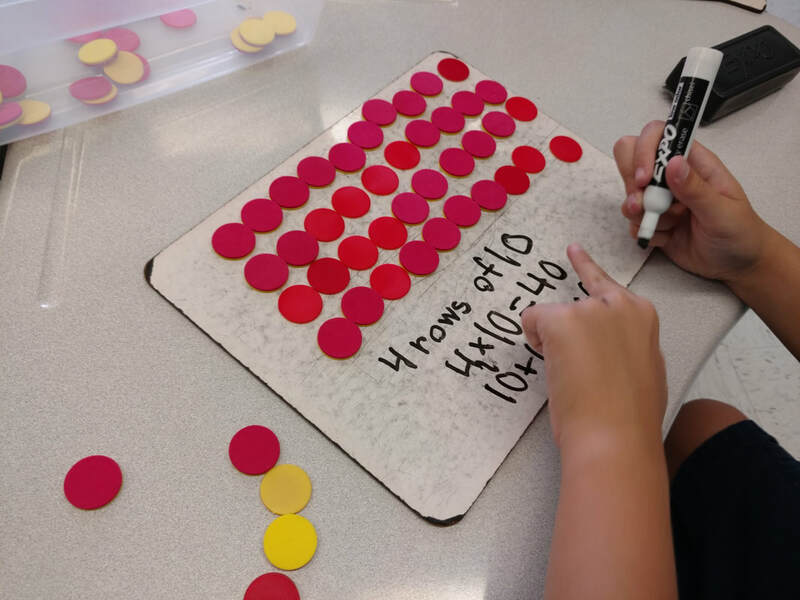 We'll be continuing to work on multiplication concepts and on solving mathematical word problems using addition, subtraction, multiplication, and division. 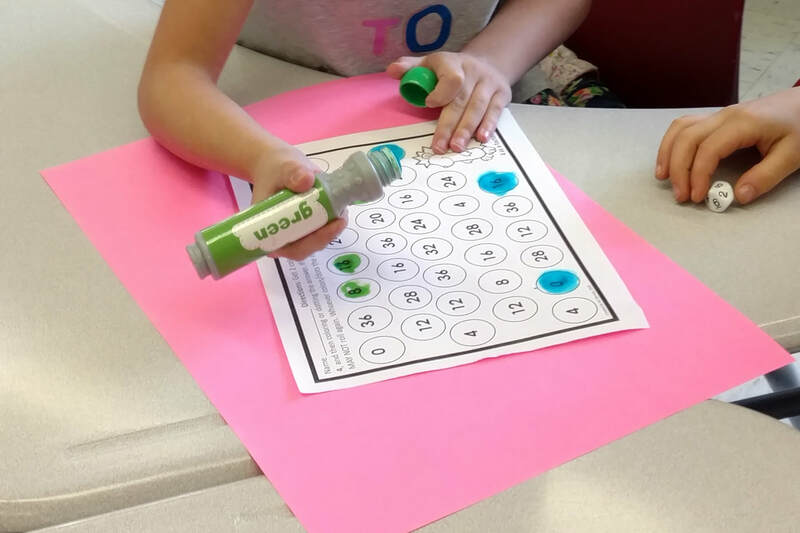 It would be extremely beneficial to your child to practice addition, subtraction, and multiplication facts at home 2 or 3 times per week. If you click on the tab labeled "Ideas for At-Home Practice", you'll find some links to online resources that might be helpful. 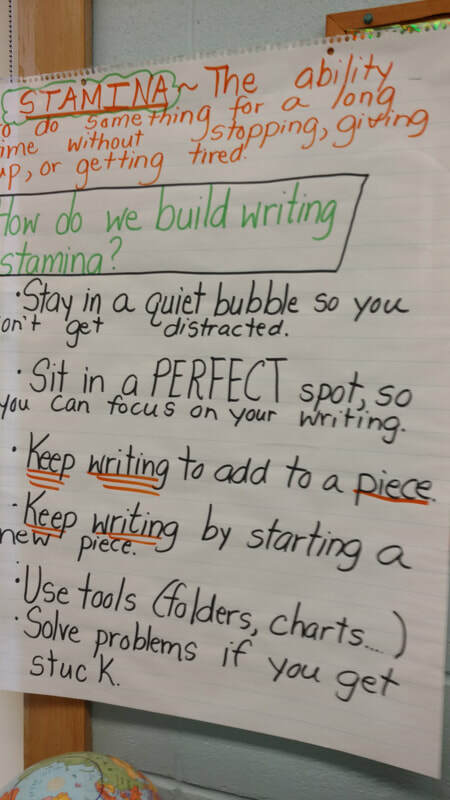 During writers' workshop, the students have been working on building writing stamina. 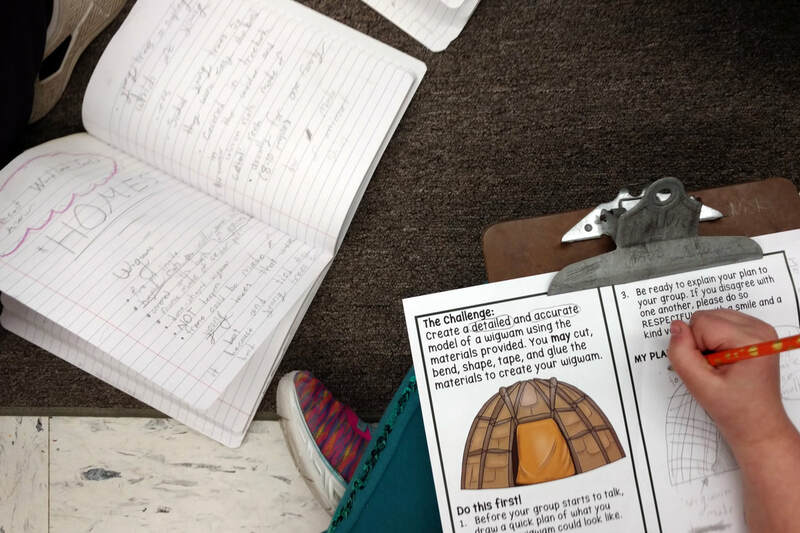 In our classroom, we define stamina as doing something for a long time without giving up or gettting tired. Building writing stamina involves doing a LOT of writing. 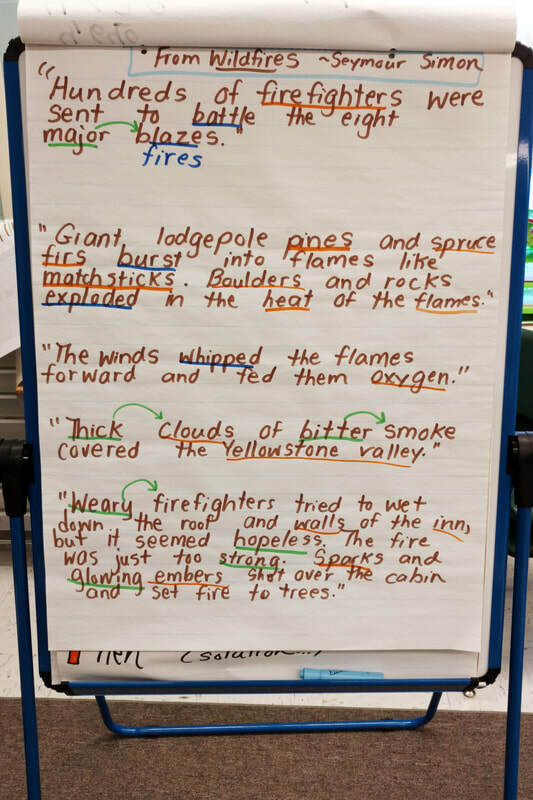 The children have also been learning about how to construct well-organized paragraphs. Our next unit will focus on writing realistic fiction stories. 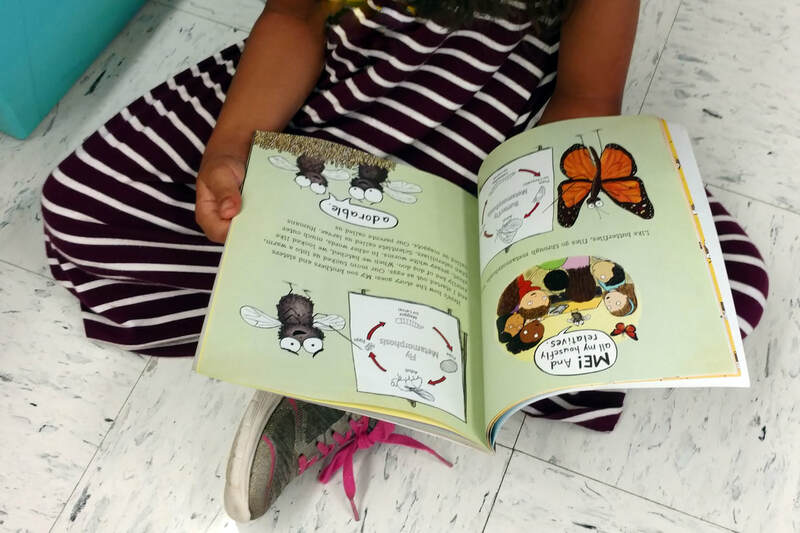 Since having strong reading stamina is as important as having strong writing stamina, students spend a lot of time reading each day. 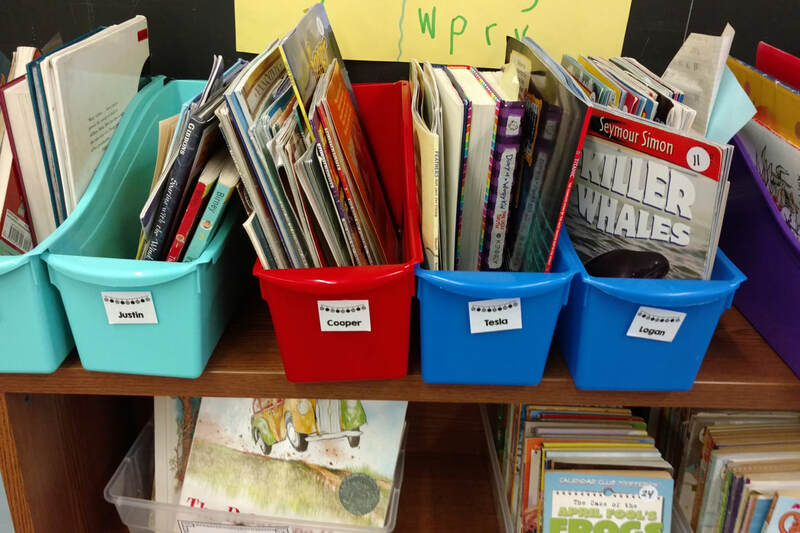 Each child has his/her own book bin, which is full of books. Please have your child read for practice and pleasure at home. Just 20 minutes per night can result in notable reading progress. To learn more about genres (types of writing) and to generate enthusiasm for books, we had a BOOK TASTING party! Each set of desks had bunches of books in a particular genre: poetry, traditional literature, nonfiction, realistic fiction, and fantasy. 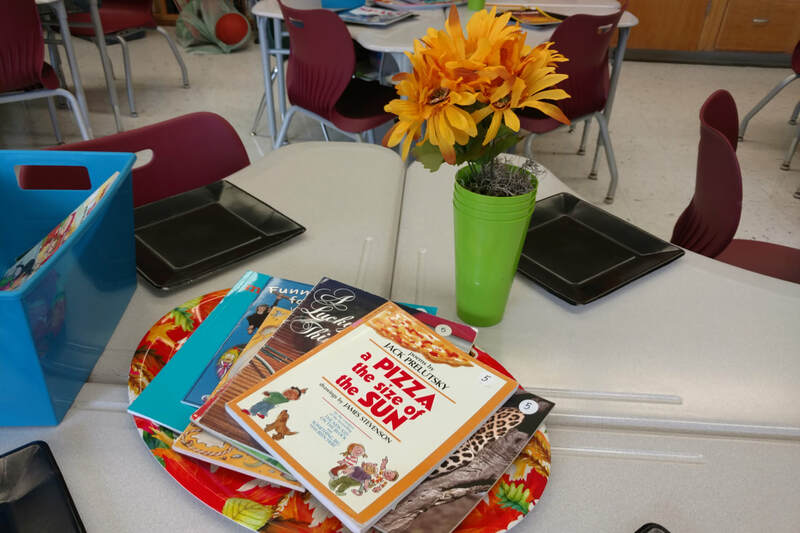 Students had about 7 minutes at each set of desks to taste books from that genre. 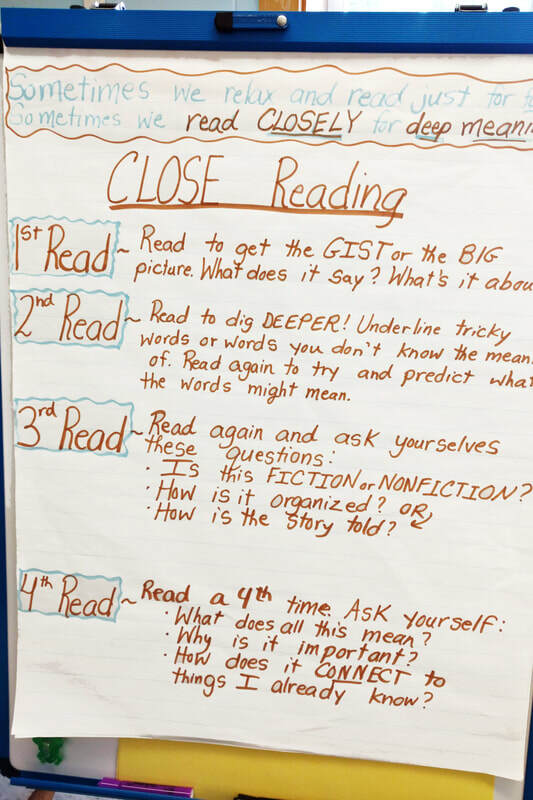 Our reading comprehension focus has been on reading CLOSELY and thoughtfully. 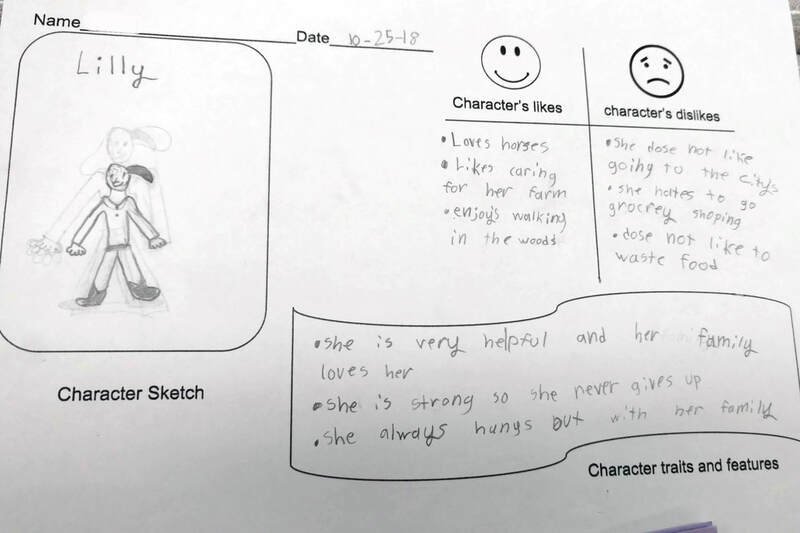 We've also been learning about characters in books with an emphasis on character traits, character motivations, character change over time, and how characters drive a story forward. 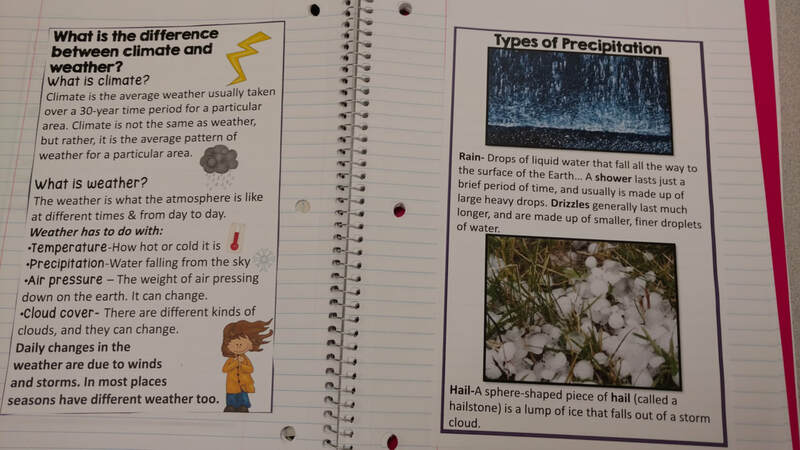 During our content block, we've been learning about clouds and weather. 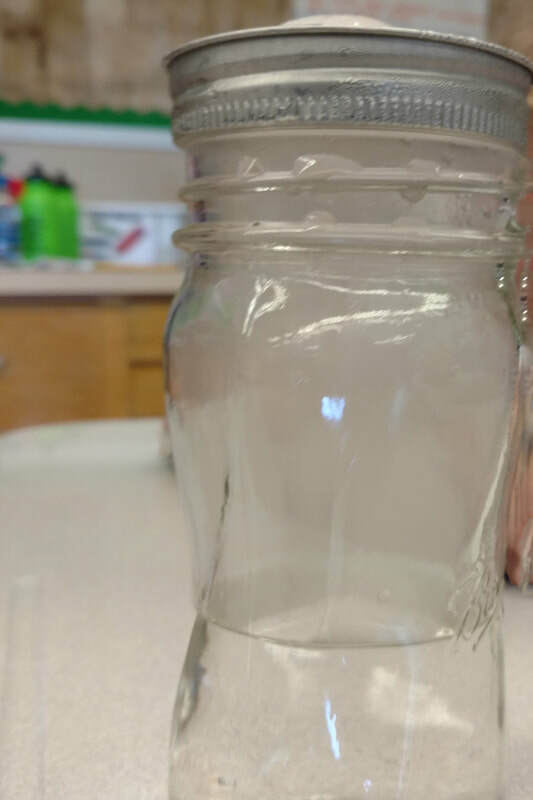 We created clouds in jars, added information to our science notebooks, and read informational texts about clouds and weather. 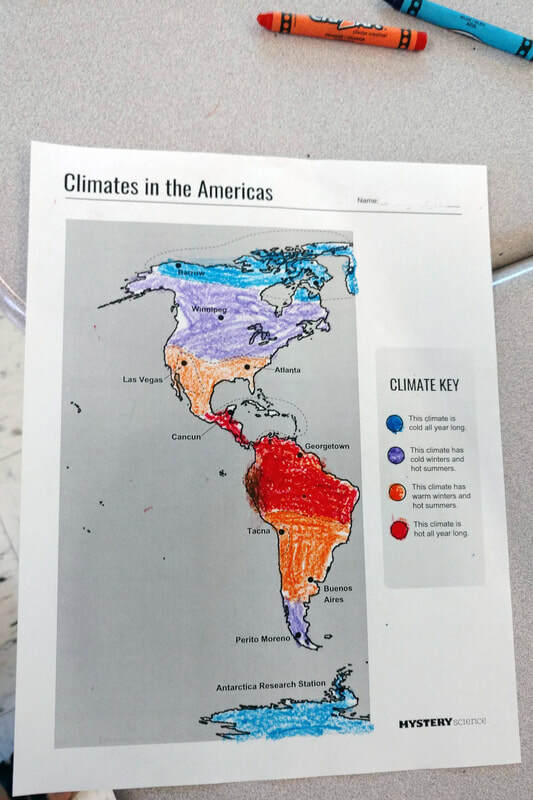 We've even tied in some map skills by creating a map of the world's climate zones. 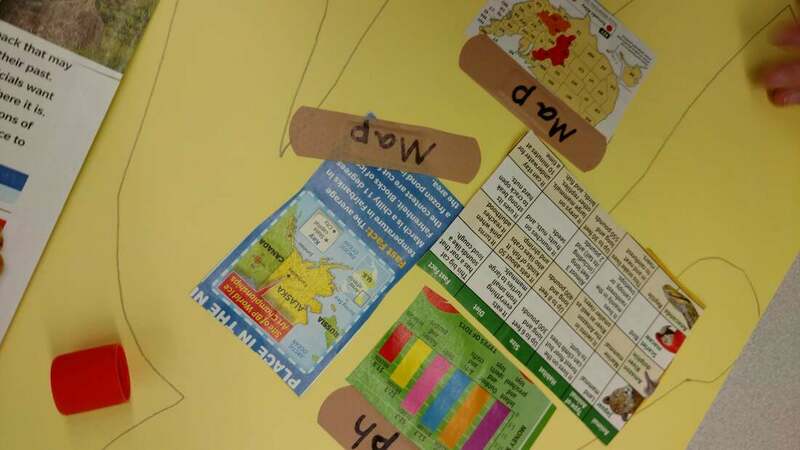 Soon, we'll wrap up the weather unit and begin learning about Native Americans of Connecticut and the Northeast Woodlands. Goodies with Grandparents & CRAZY SOCK DAY! -- October 17th from 8-8:30 a.m. Veteran's Day Assembly in the gym -- November 9th at 9:05 a.m.
We've been accomplishing a lot since my last post. Here are a few of the things we've been doing. 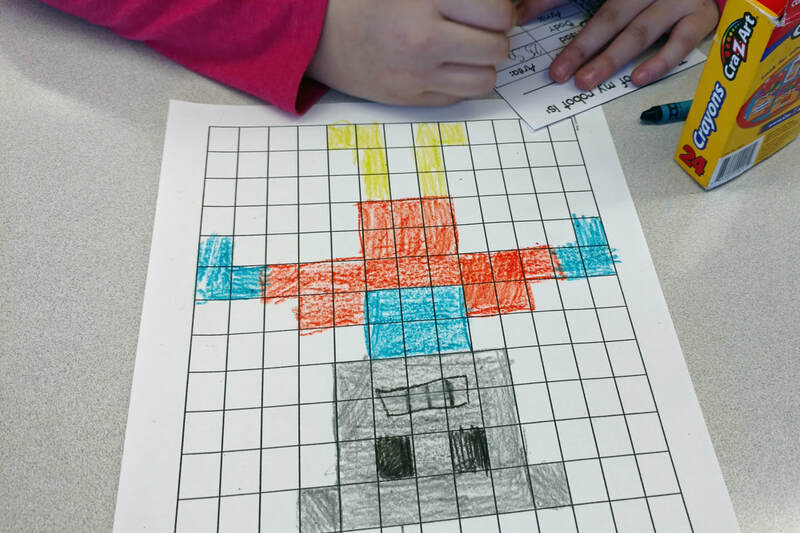 In math, we've finished up several units. 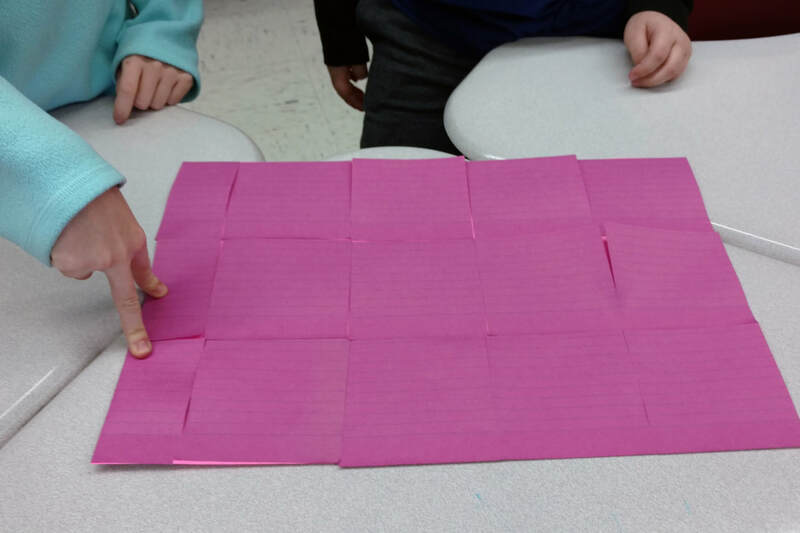 During our fraction unit, the students worked hard to show fractions, name fractions, compare fractions, put fractions in order, and find equivalent fractions. The children created drawings and number lines and used fraction bars throughout our fraction unit. If you would like a fun review option, I HIGHLY recommend checking out abcya.com. Online play is free. 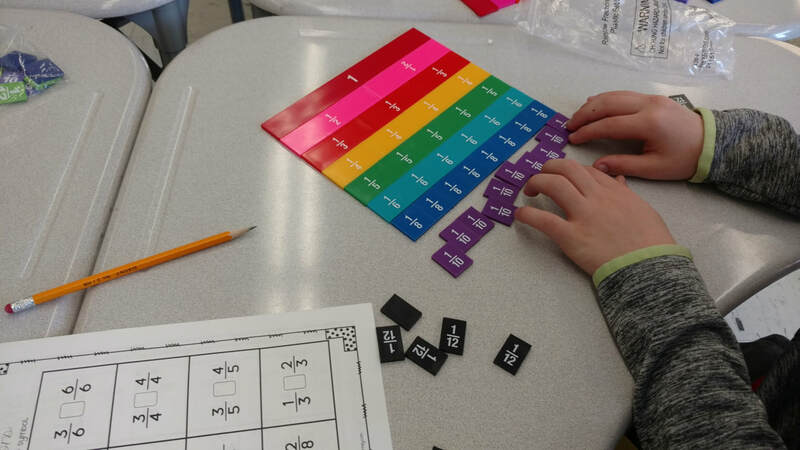 The Fraction Fling game is fun. 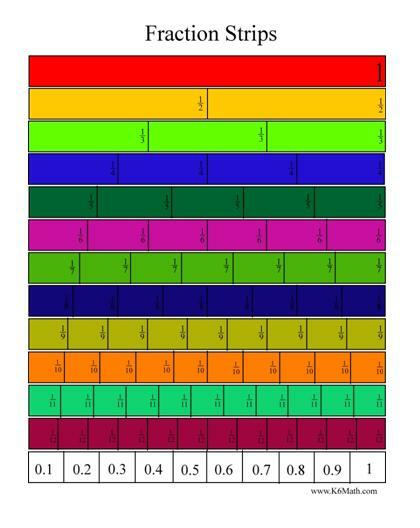 There are also fraction tiles that your child can use to explore. (See the top screen shot above.) 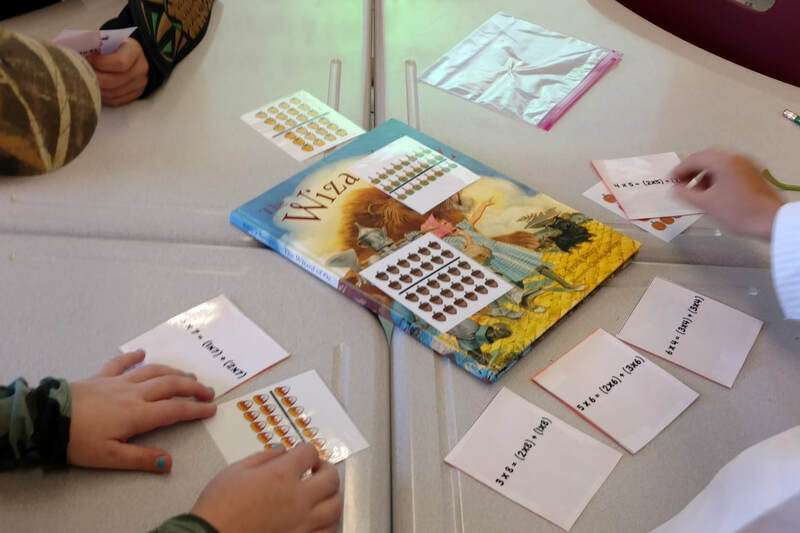 Your child can drag fraction tiles to the workspace to find equivalent fractions or to compare the sizes of fractions. 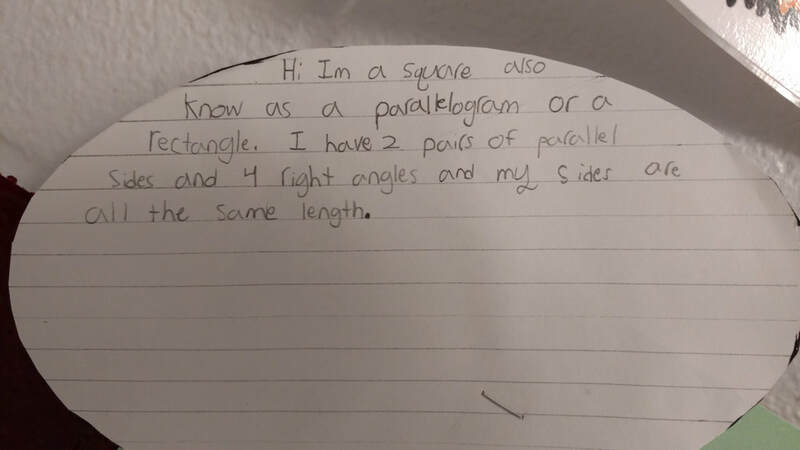 Students practiced describing and classifying quadrilaterals based on their attributes. 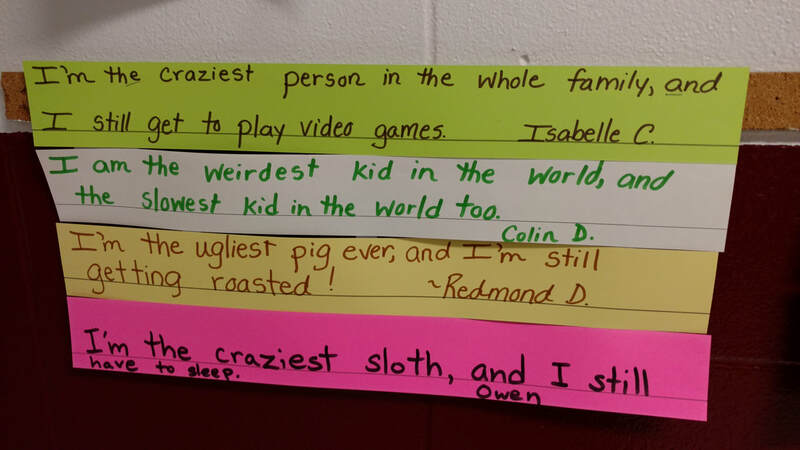 They created these fun Quadrilateral Quotes posters to show off their knowledge. 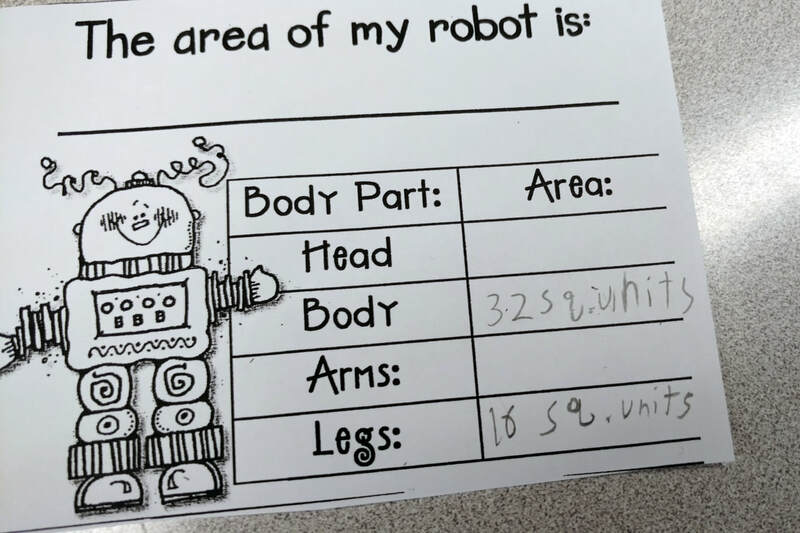 Students also learned to calculate the area and perimeter of shapes and regions. In other math news, we've worked on graphing skills. The children have continued to work on committing multiplication facts to memory. 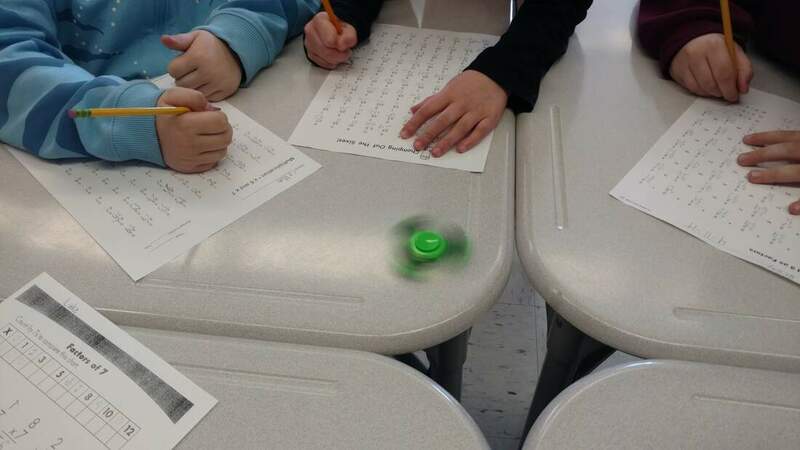 One of their favorite ways to practice is to set a fidget spinner in motion and do as many facts as they can before it stops. 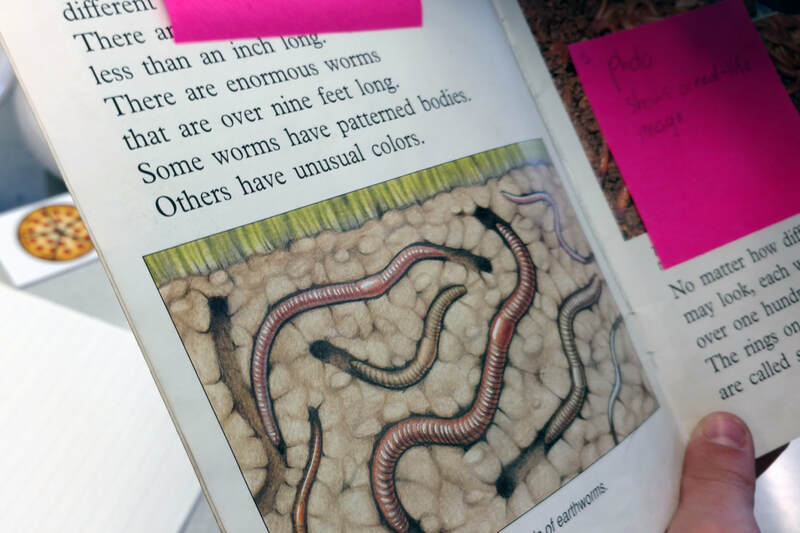 During our reading block, we've been reading quite a lot of nonfiction text. 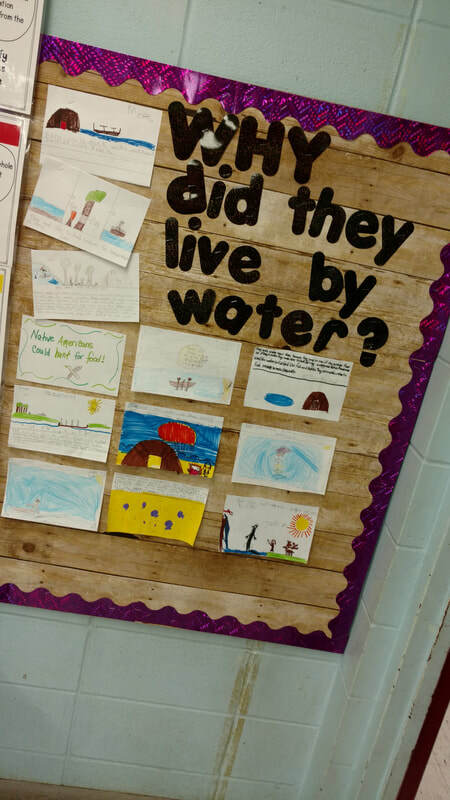 Much of our focus was on cause and effect, answering open-ended questions using specific text evidence, and finding and utilizing text features to deepen understanding. The students have just finished up some opinion pieces based on research! 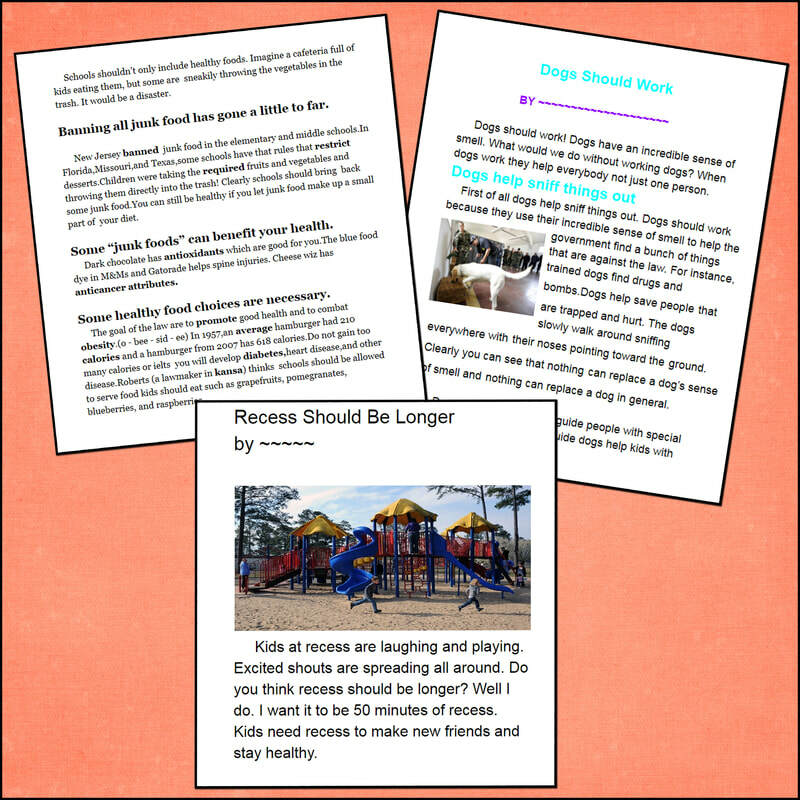 Each student read a set of articles and formed an opinion about a topic. They had to write a multi-paragraph piece explaining their reasons using facts from their research, details, and examples. Students also crafted introductory and concluding paragraphs. All of the students chose to compose their pieces using Google Docs. They've become quite adept at using the program. 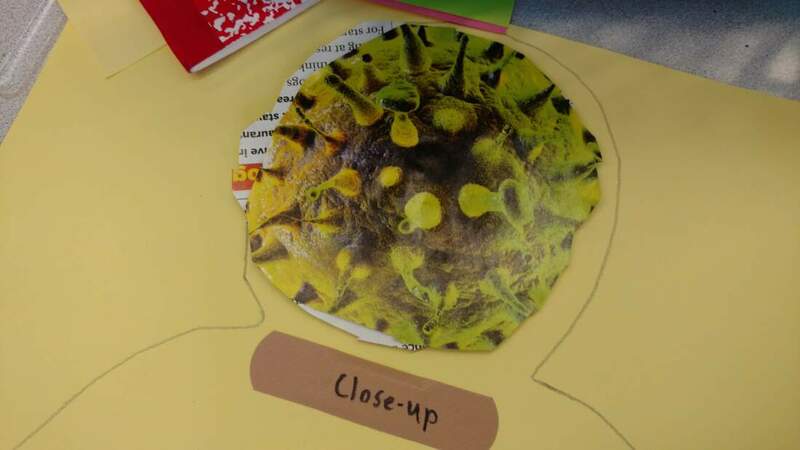 The image shows some screenshots of student work. 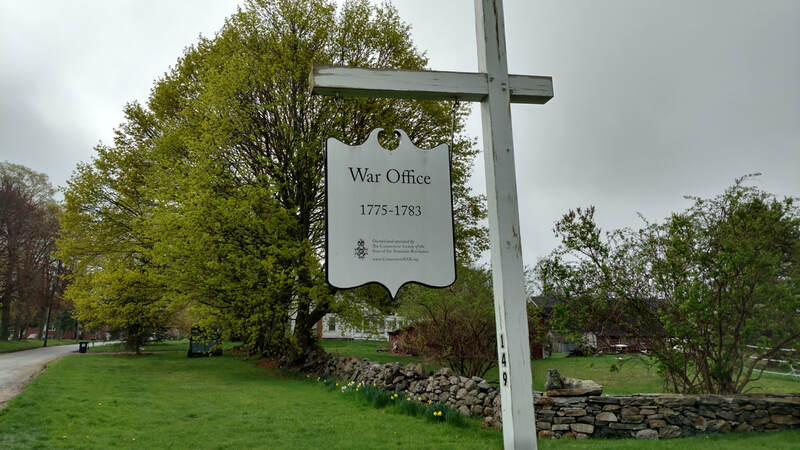 Students have been engaged in learning about the history of Connecticut and Lebanon, and we've talked about colonial times as well. We've been fortunate to have several activities this spring that all tie into that unit. Our trip to the Lebanon Green was amazing, and we are so grateful for all the hardworking and knowledgeable volunteers who made it possible. 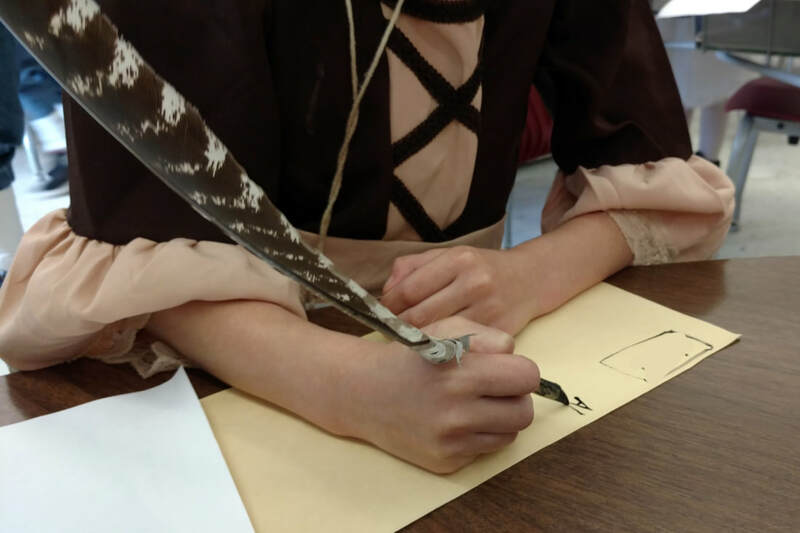 During our Colonial Day students wrote with quill pens, did colonial crafts, and played colonial games. We even made butter! 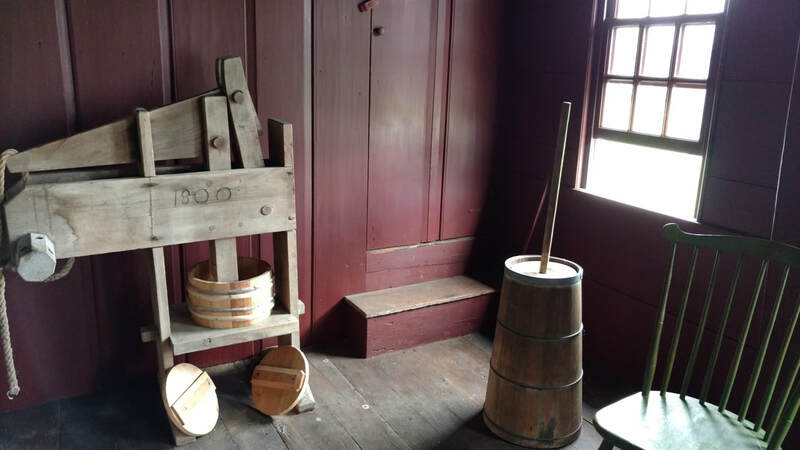 Most recently, we were able to visit Old Sturbridge Village. 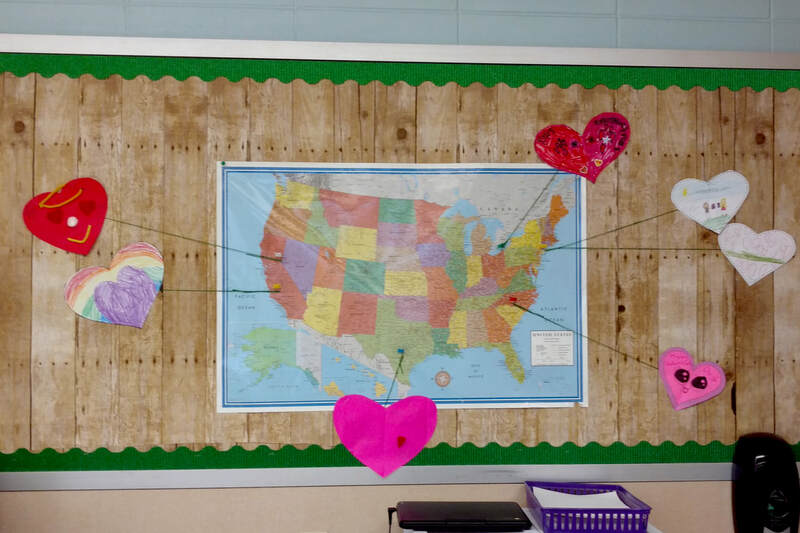 Our class is participating in a valentine exchange with 21 other classes around the country. 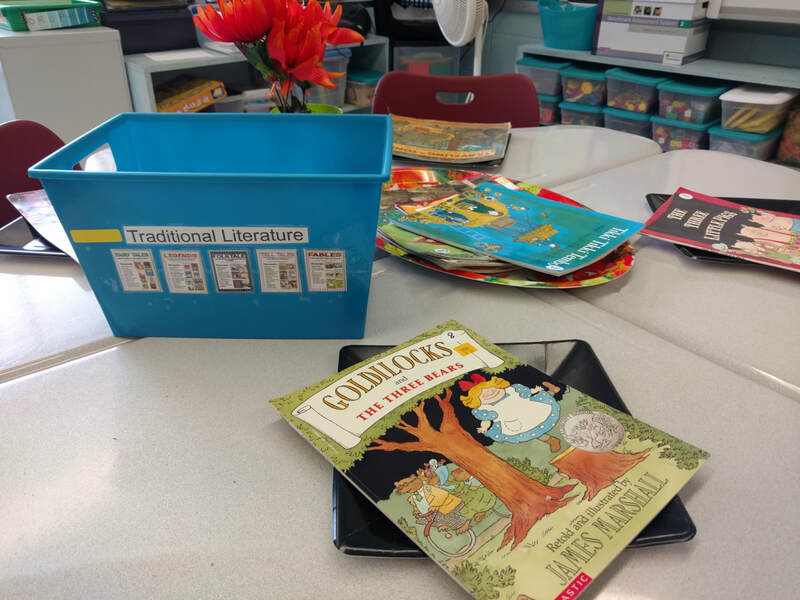 The children read some books about Connecticut to gather facts. 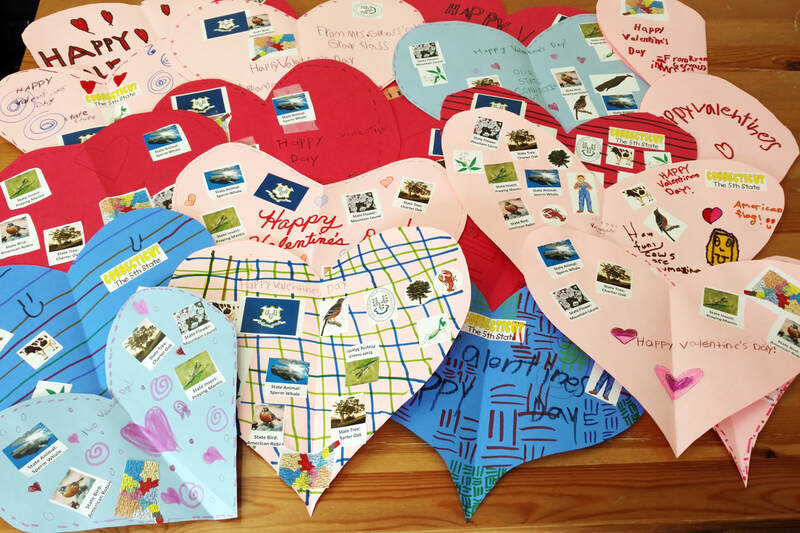 We drafted a class letter and crafted valentines to share. 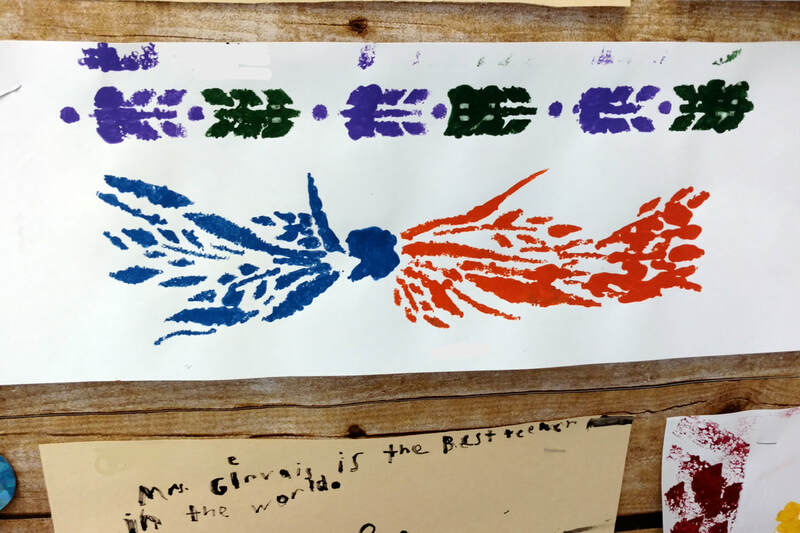 We've already received mail from several classes. 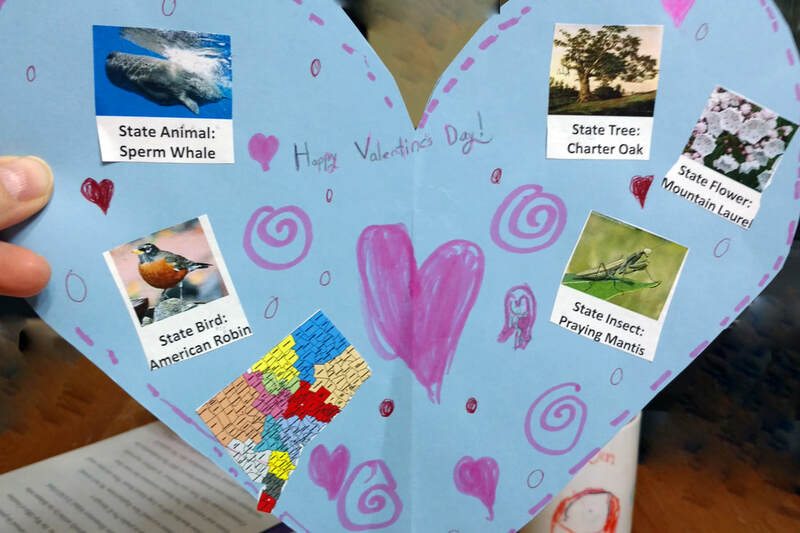 This project was a fun way to learn more about our country and to kick off our study of Connecticut. We've been reading LOTS of informational text lately. 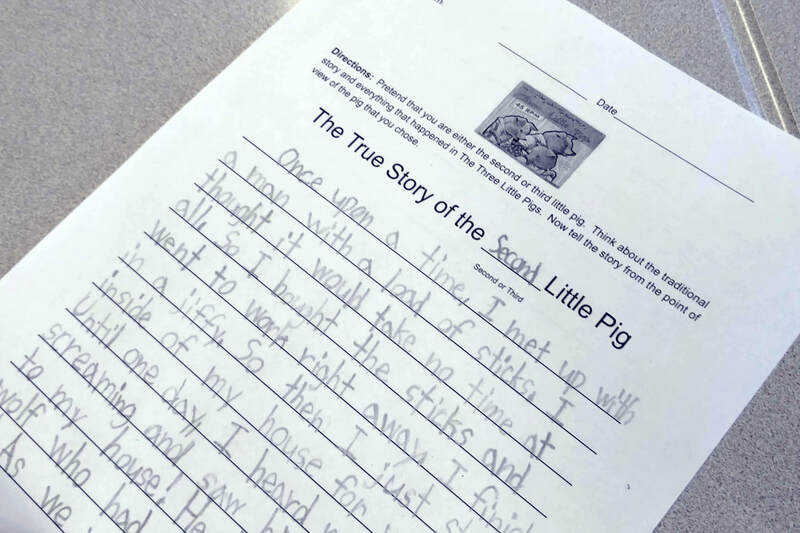 We've pulled some excerpts from text to study how authors craft interesting sentences. The children read about and researched topics of their choice during writing. They took notes on index cards and then organized them by main idea. Currently, they are drafting Question & Answer books using Google Slides. They'll be sharing their finished books with classmates. 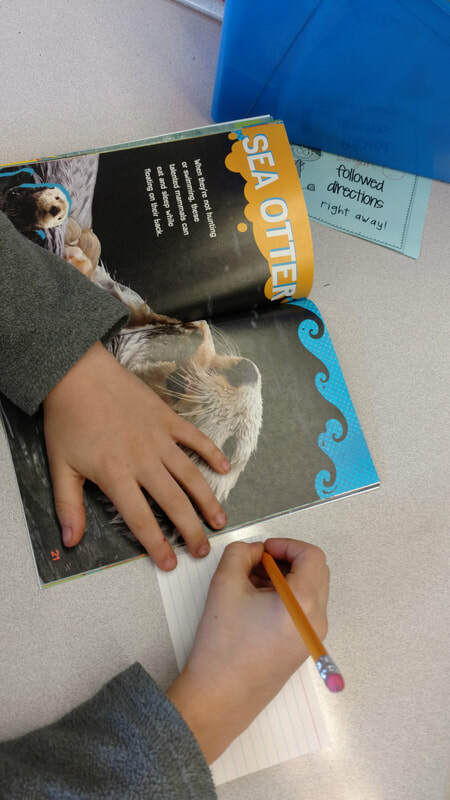 ​In reading, we've been focusing on recounting the important points in nonfiction text and working on main idea and details. We've been learning about division while continuing to practice multiplication facts. We're also working on solving multistep math word problems that require the use of addition, subtraction, multiplication, and division. We'll be diving into fractions next. Please continue to have your child practice math facts at least three times per week at home. Please focus on a balance of addition, subtraction, and multiplication. Thank you! 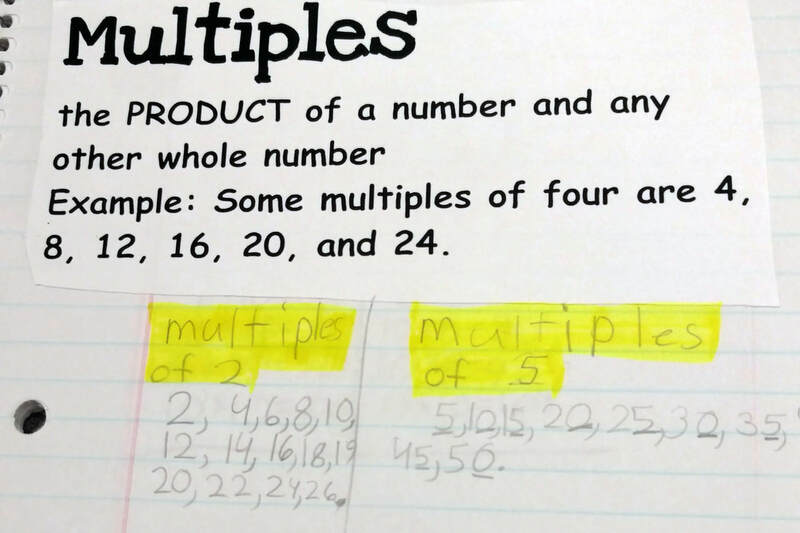 During our math block, we've been focusing heavily on multiplication concepts. 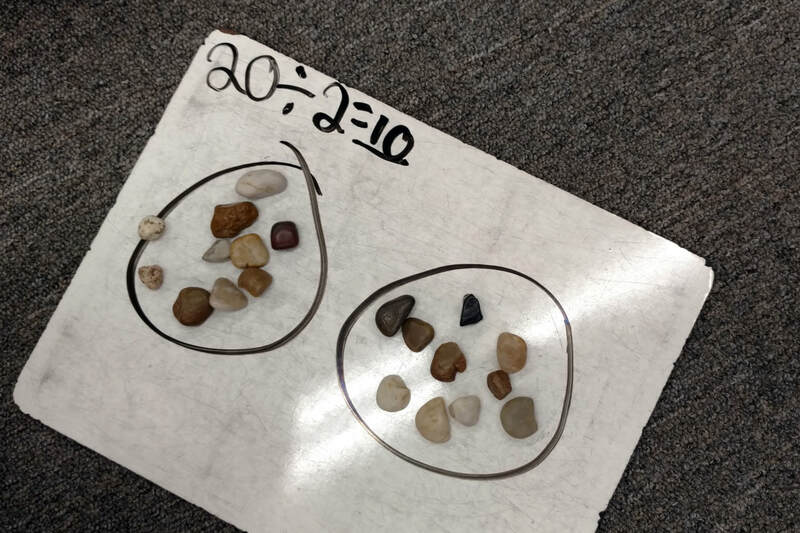 The students have experimented with different ways to solve problems: repeated addition, skip counting, creating arrays, and creating equal groups. 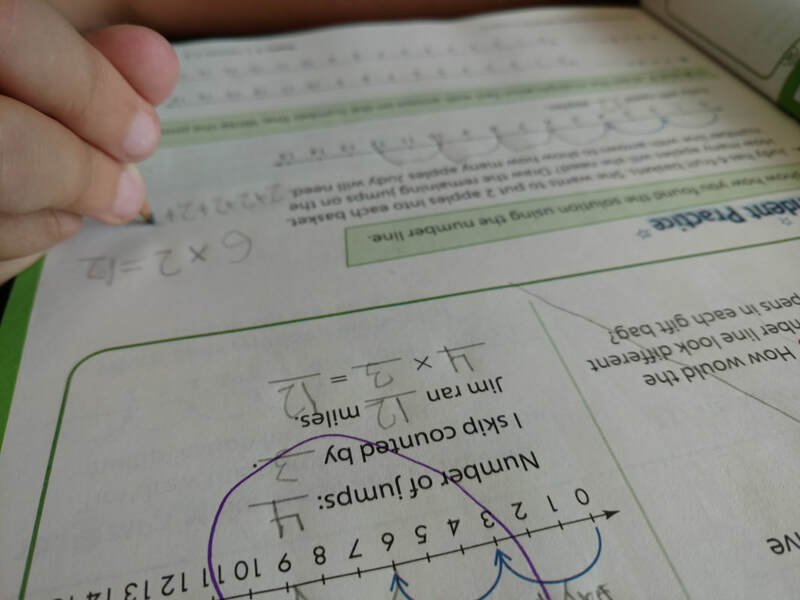 During weekly homework, it would be beneficial for students to start practicing multiplication facts as well as addition and subtraction facts. In reading, we've been focusing on reading for meaning. We learned that authors, characters, and people in our daily lives have different points of view. 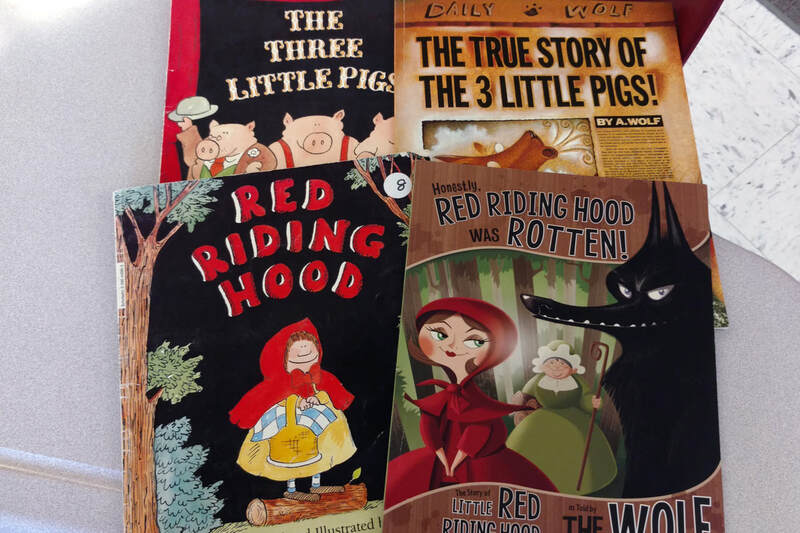 We read different versions of fairy tales which were told from different characters' perspectives. 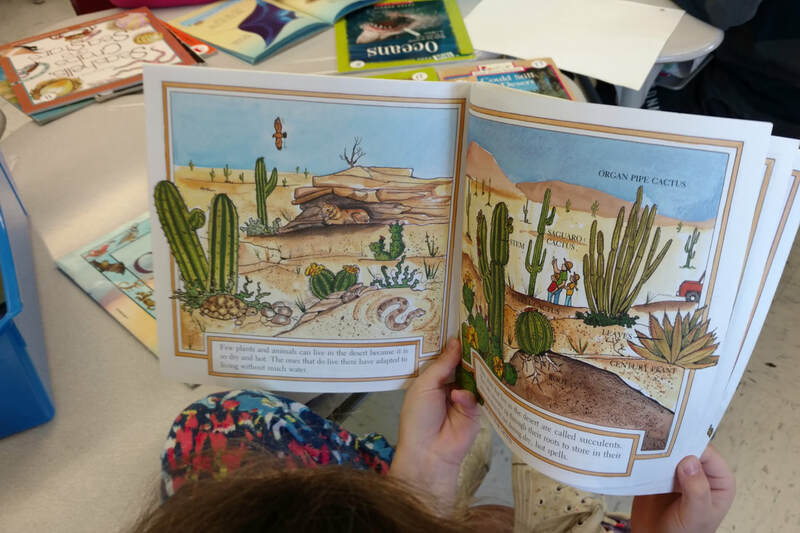 We delved into more serious topics by reading a biography of Christopher Columbus and then the historical fiction book Encounter by Jane Yolen. This story is told from the point of view of a native child meeting Columbus for the first time. 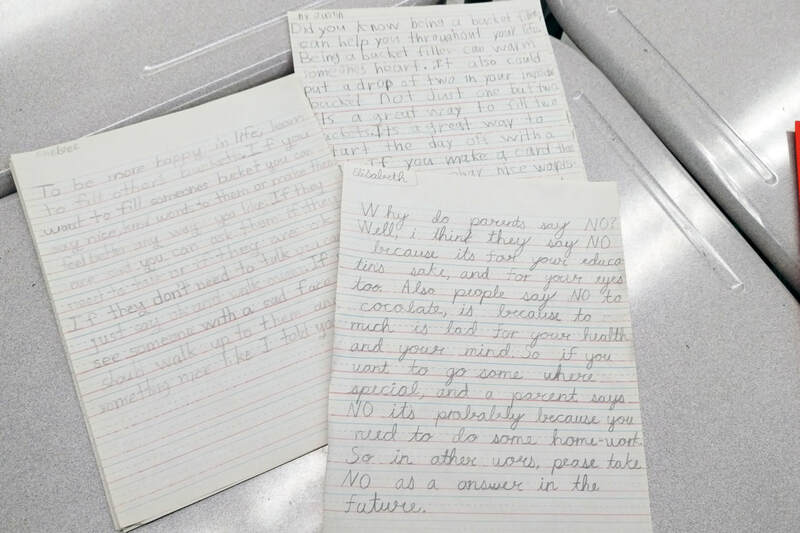 ​During writing, students wrote opinion pieces that expressed their own points of view about a variety of topics. Currently, we are focusing on reading literature and identifying the author's central message. 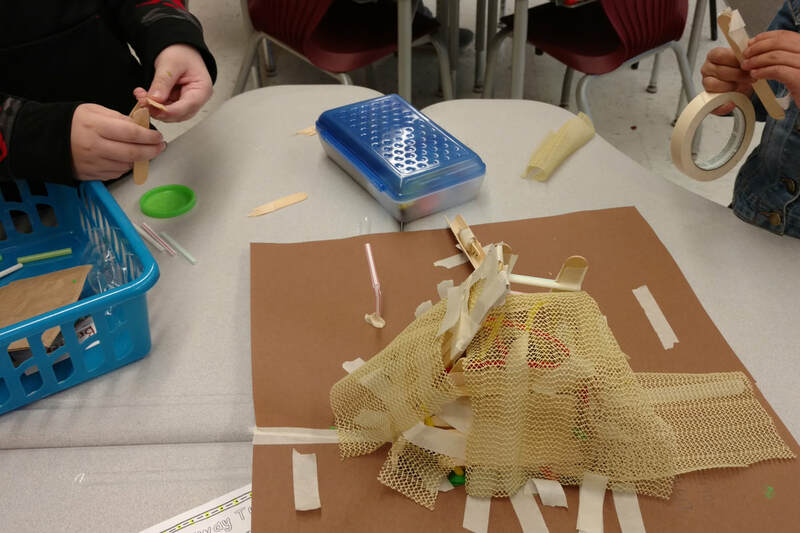 We finished up our wigwams and wrapped up our unit on Connecticut Native Americans. 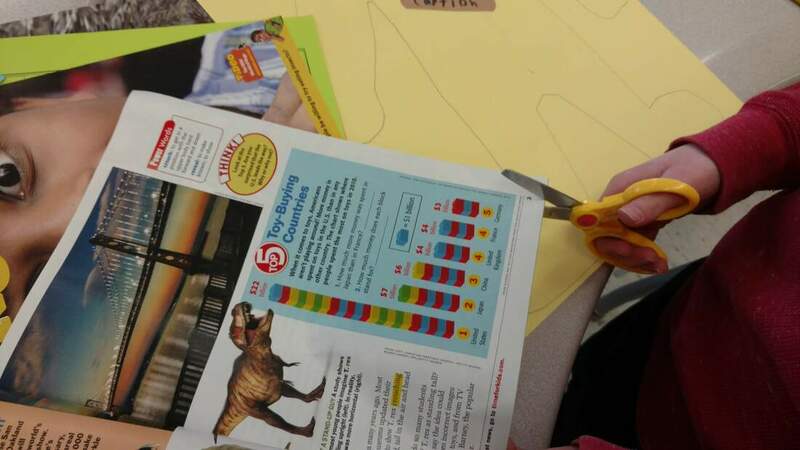 ​We are currently learning about how fossils can be examined to tell us about creatures that lived long ago. 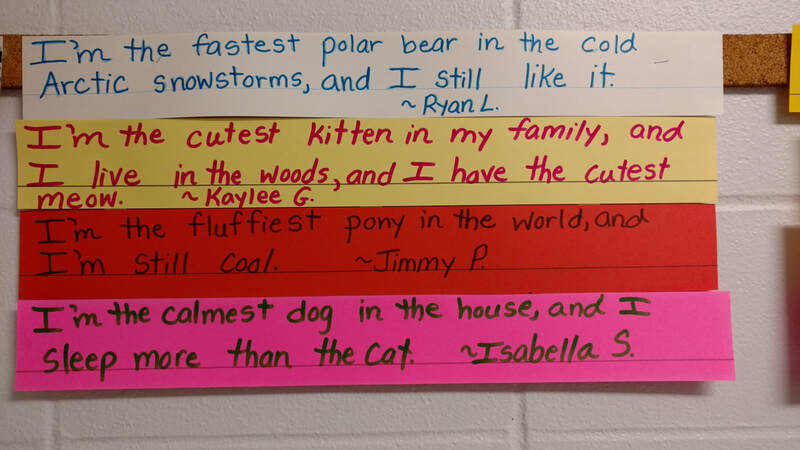 We've finished up our weather unit. To wrap things up, the class did some shared research and writing. Since we've been working on paragraph writing during writer's workshop, drafting a piece about our unit of study in science just made sense. Here's what we came up with! Enjoy! People have some unusual ideas to explain thunder and lightning. Have you heard any of these? Some families say thunder is elves bowling up in the sky. Others think the sky is angrily aggressive when it thunders or that kids are up in heaven stomping their feet. Have you ever heard someone say that lightning is God playing with the flashlight on His smartphone? Thousands of years ago, people thought lightning was the gods being angry. None of these ideas are true. What is thunder and lighting? Cumulonimbus clouds (dark thunderclouds) have small ice crystals and rain droplets that each contain a tiny bit of electricity. The electricity builds up and intensifies until a lightning bolt strikes! 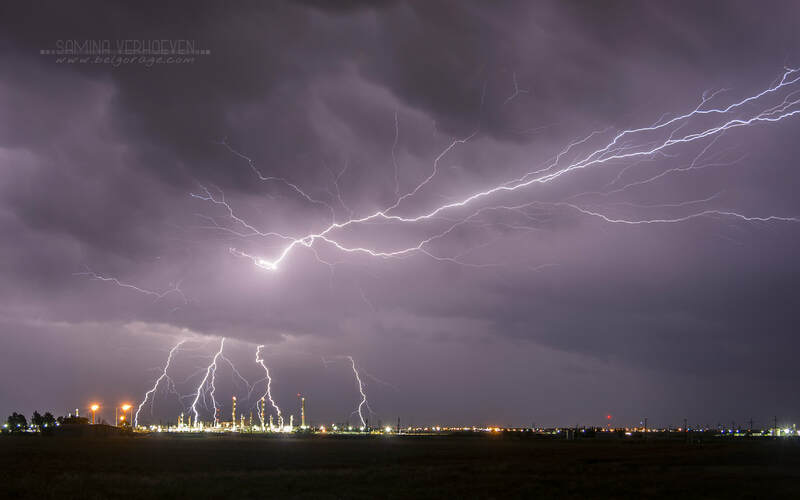 Lightning is electricity, and the lightning bolts travel to the ground in a flash! The lightning makes the air super hot. That hot air expands incredibly quickly. That’s what makes the loud rumbling of thunder. Light travels faster than sound waves, so you do not hear the thunder immediately. How do people stay safe in a lightning storm? You can't stop lightning from coming, but you CAN prepare and stay safe. If you are outside or swimming, immediately go inside. If you’re ever in a field and you can’t get to shelter, DON’T be the highest thing in the field. Lightning strikes the highest thing. If you’re driving, you should be in a car. If lightning strikes the car, it will go through the car instead of you. Indoors, stay away from anything that is connected to wires. 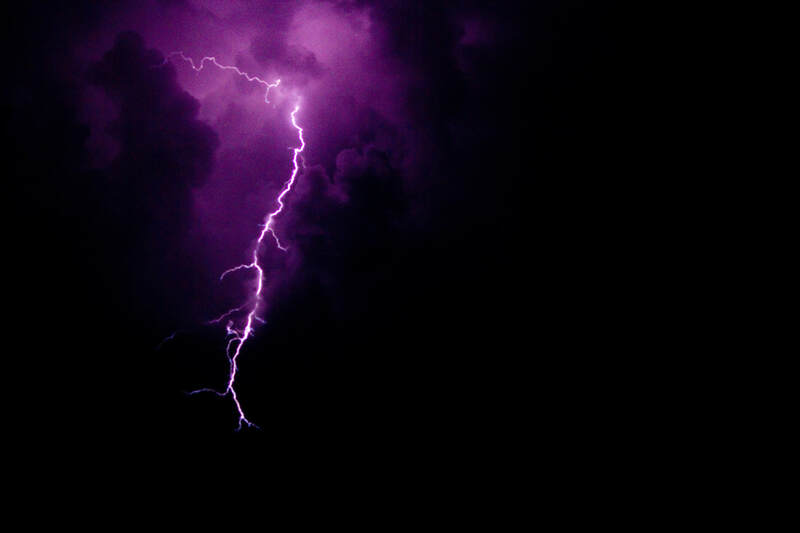 Don’t shower or bathe during a lightning storm, because electricity could travel through the metal. 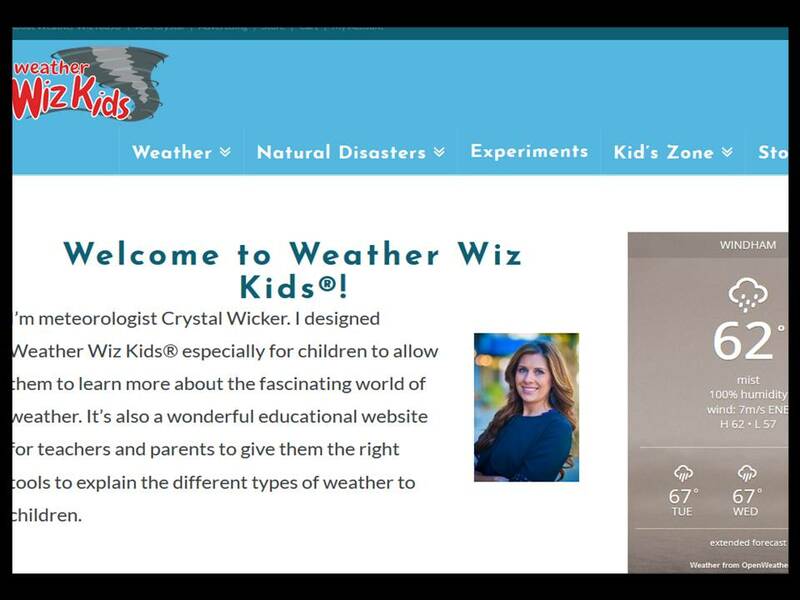 If your child is interested in learning more about weather, the website weatherwizkids.com is worth checking out. It's hard to believe it's October! Your children and I have been very busy in the classroom, and I have so much to share with you. We've finished our first math unit on place value. 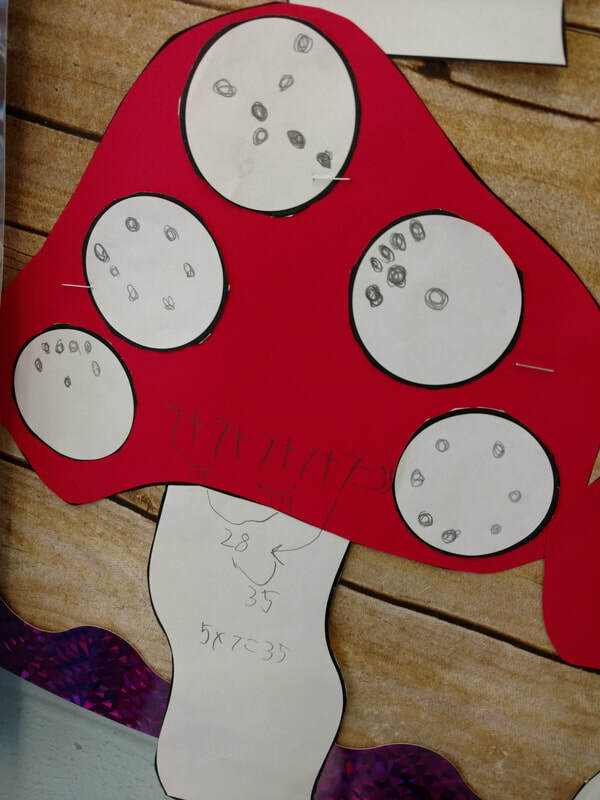 The children have also spent a considerable amount of time playing games that will improve their fluency with math facts. 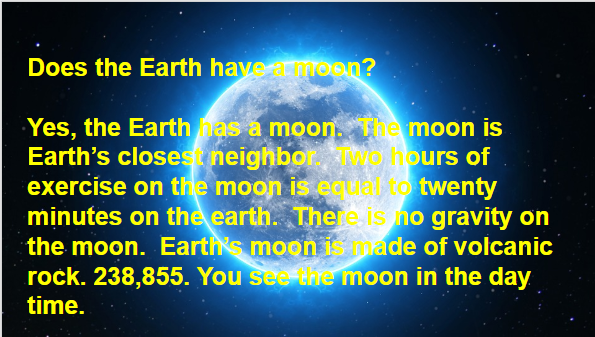 We've just started working on a unit that will focus on rounding and estimating. 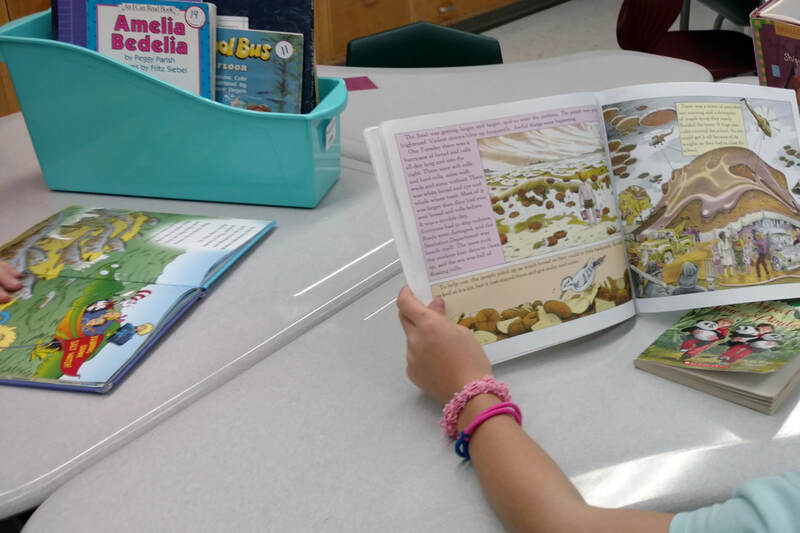 During reading, we've been working to build our reading stamina by reading for extended periods of time. 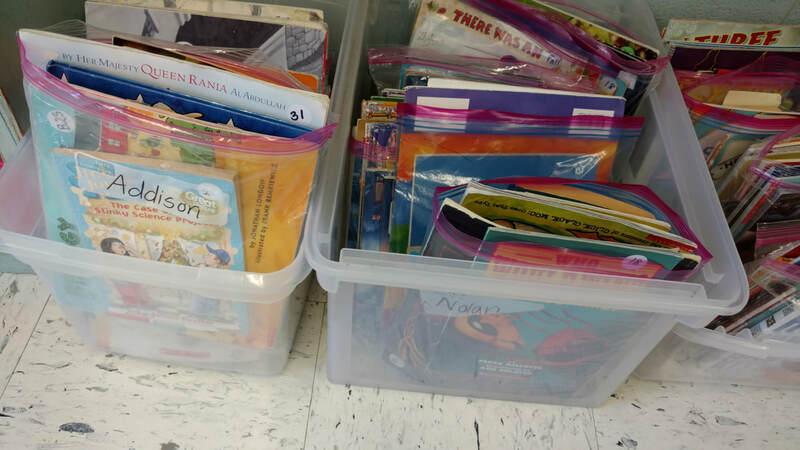 Each of the children has a book bag with self-selected books. The students have worked on making inferences and identifying character traits for main characters in literature. 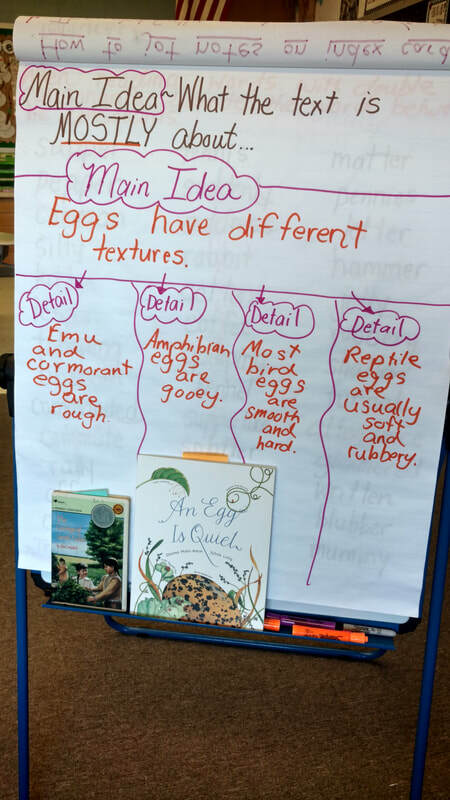 We've focused on determining the important ideas when reading nonfiction. 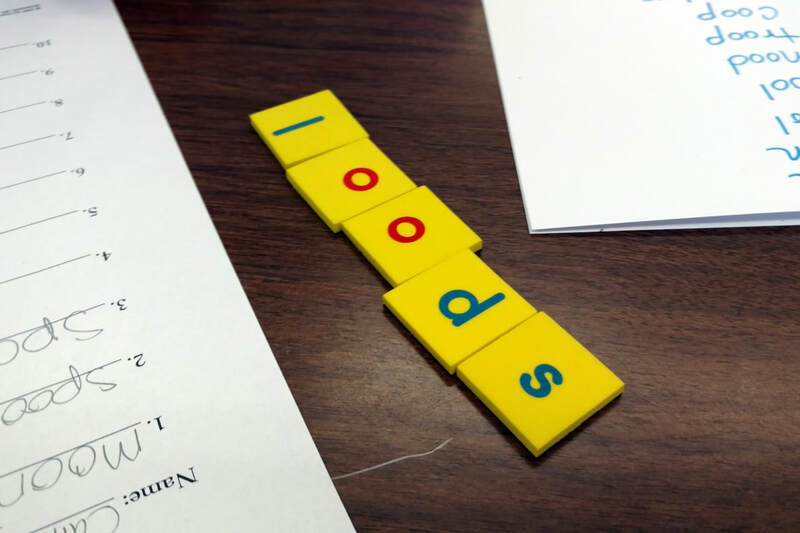 Word study and phonics has also been included in our literacy block. 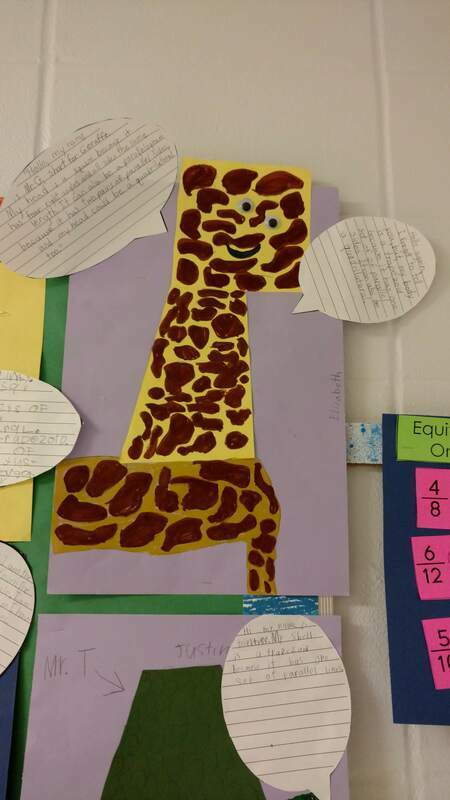 We've finished up a sentence review unit in writing. 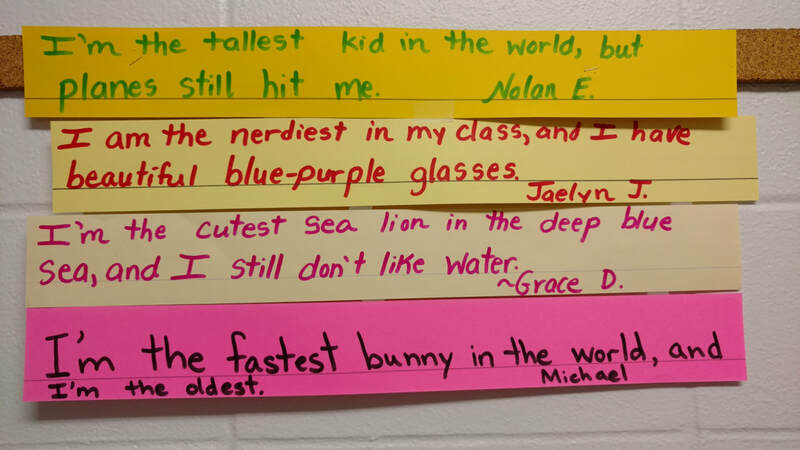 One activity we did was writing compound sentences. We enjoyed the stories Verdi by Janell Cannon and Fireflies by Julie Brinckloe. We examined some of the beautifully written sentences, and were inspired to try some of our own. Currently, we're learning about writing paragraphs. 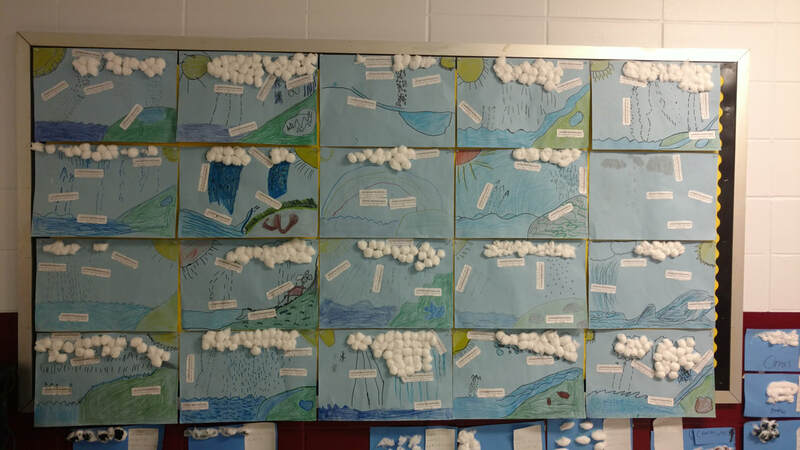 During science, we've been learning about the water cycle and types of clouds. 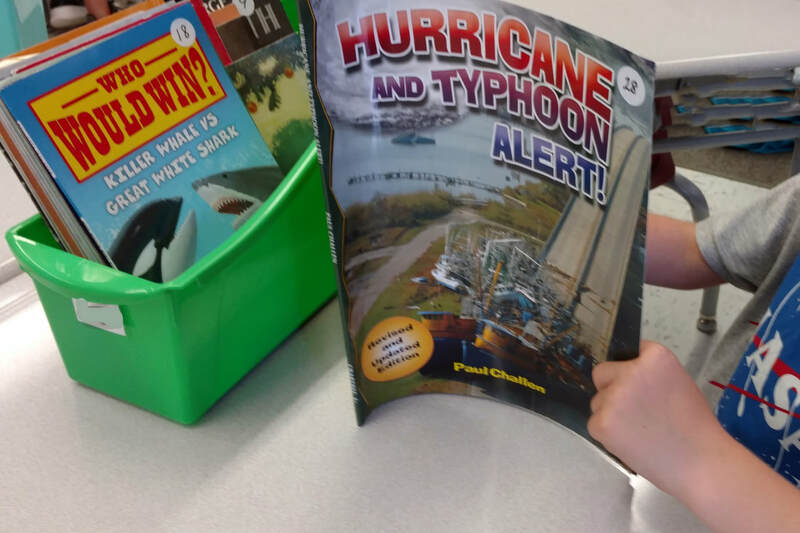 We'll be researching severe weather next. 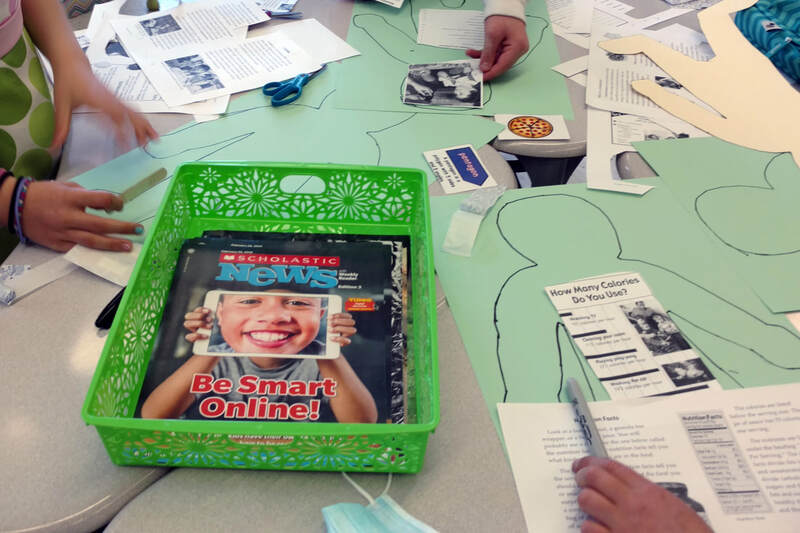 During the month of October, we'll begin a unit on Native Americans in Connecticut. Welcome! My name is Mrs. Gervais. I'm so thankful that I get to be your child's teacher.